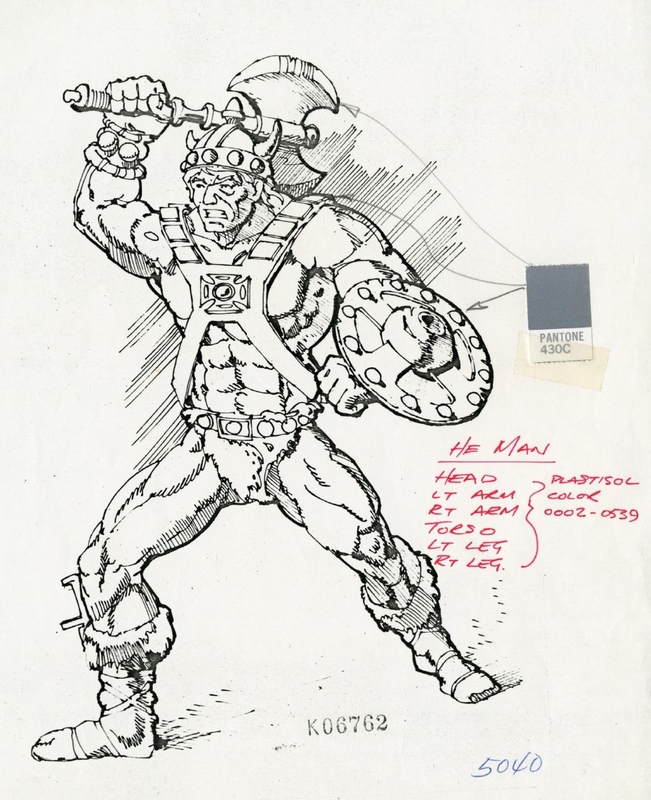 One of the most exciting things to come out for Masters of the Universe in recent years is the Mark Taylor Original B-Sheets Collection, first offered for sale at the 2016 San Diego Comic Con. 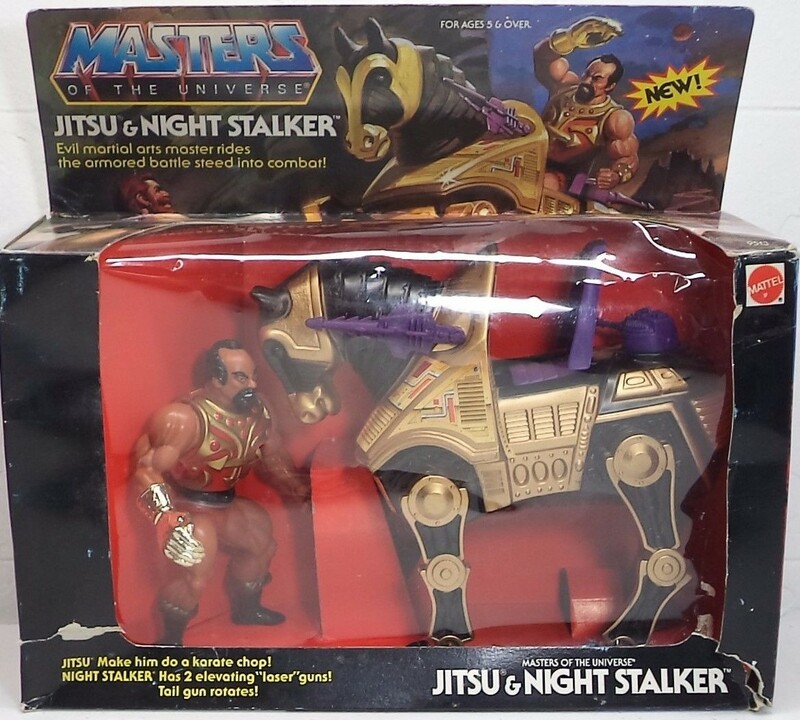 The focus of this blog has always been the vintage 1980s MOTU toyline. 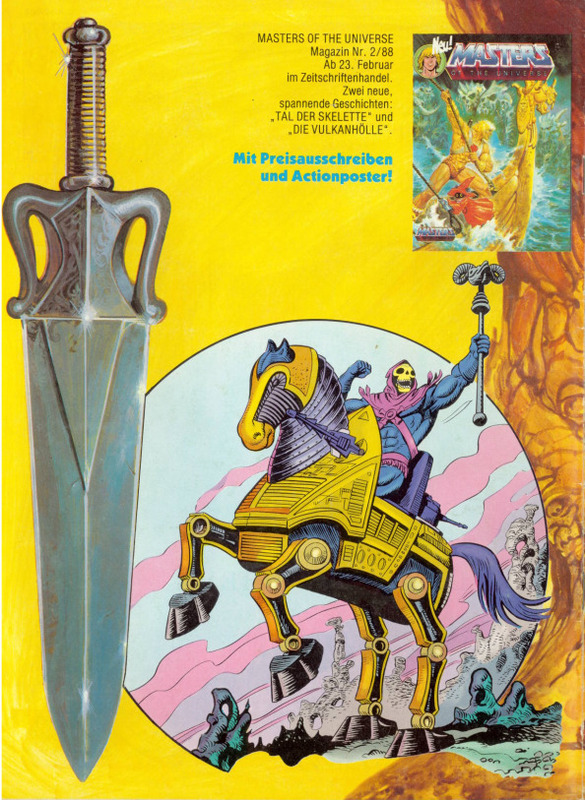 I’m not breaking with that focus, but because this collection gets at the origins of He-Man, I think it’s very apropos to review it here. Produced by The Power and the Honor Foundation in collaboration with Super7, the portfolio consists of eleven pieces of original artwork by Mark Taylor. 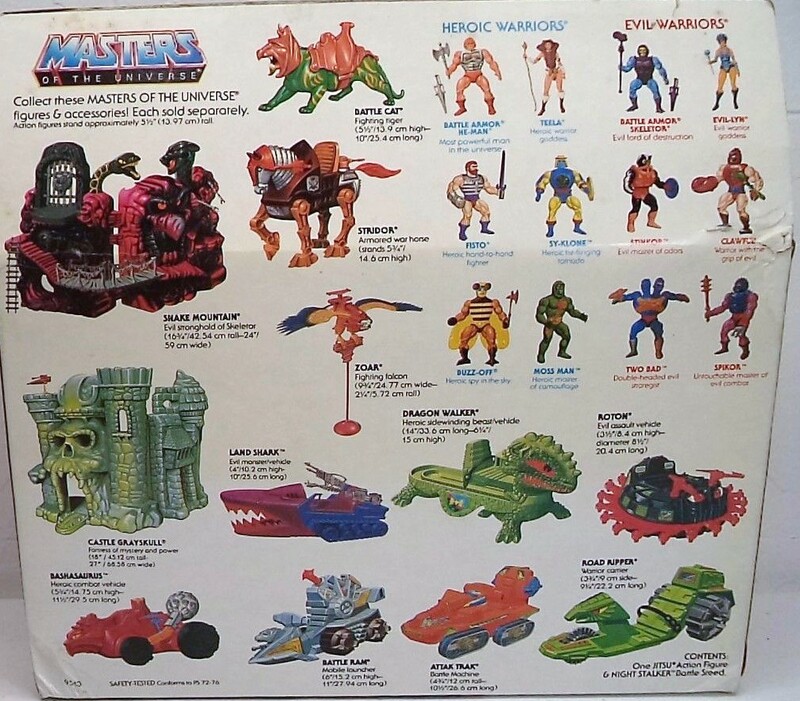 These were the essential designs that culminated in the Masters of the Universe toy line. 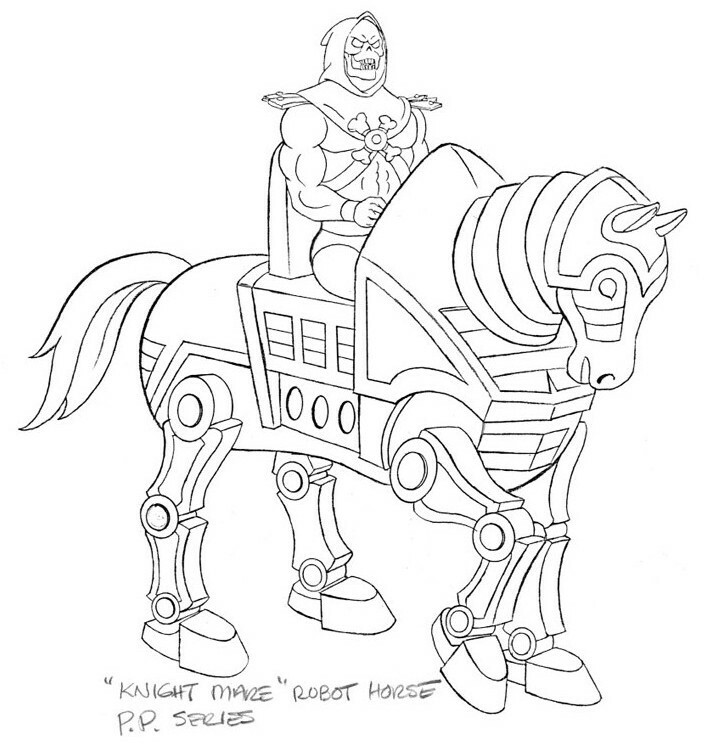 Several of these pieces have been available for some time in black and white from such sources as Grayskull Museum and Mattel’s 2009 art book. Some were included in the 2011 Power and Honor Foundation Catalog. 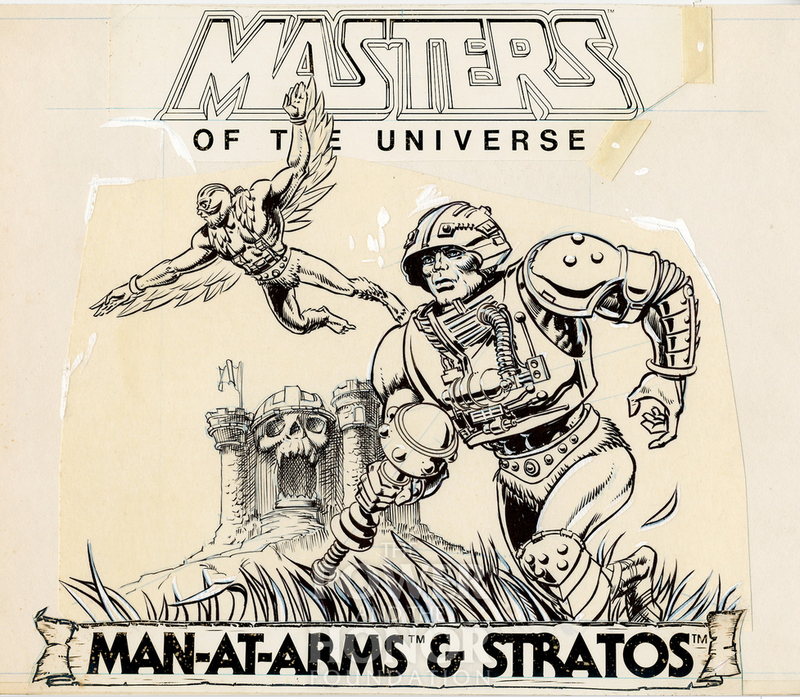 Others were made available in the Dark Horse Art of He-Man book (which included a great deal of artwork shared by Foundation). Some were even offered as Easter eggs in the 2012 Glitschsoft game, He-Man: The Most Powerful Game in the Universe. However, most of this artwork has never been seen in full color until now. This is also the first time, to my knowledge, that the original concept artwork for Zodac has been made available to the public. Before you even get to the artwork, there’s a lot to unpack in the cover. 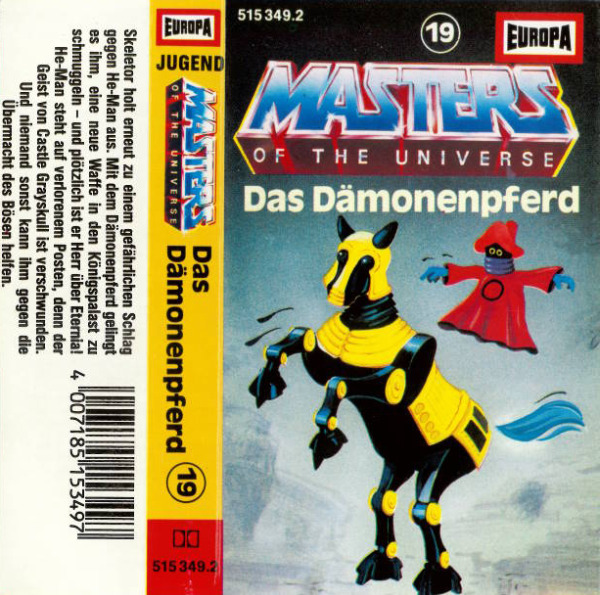 The front features a very subdued silver version of the Masters of the Universe logo, as recreated by Emiliano Santalucia for the BCI DVD releases. The familiar exploding rocks from the vintage card art are punctuated in red around the title of the collection. 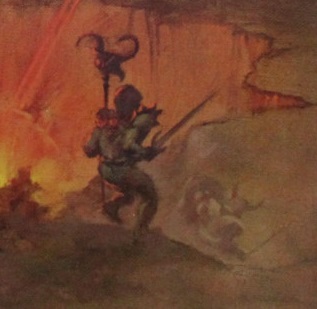 In the background there is a blown-up, gray-on-black image of the original concept He-Man design. Everything is slightly embossed for a very nice three-dimensional feel. 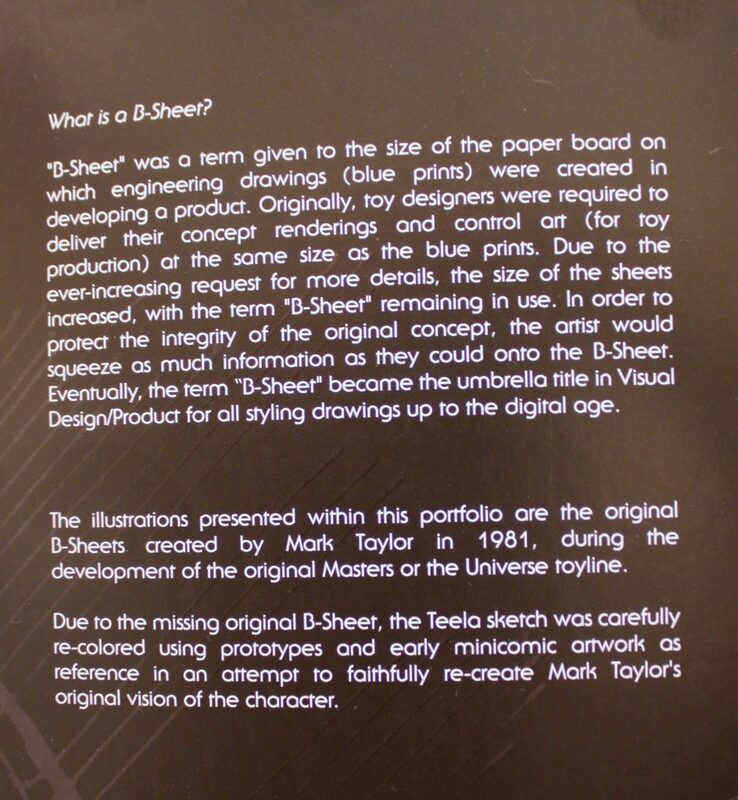 A note from the back cover – the original full-color Teela drawing was lost at some point. The one included in this collection was carefully recolored from other early source materials to capture the original intended look. Mark Taylor’s B-sheet designs are printed on thick, high quality card stock. I’ll cover each individual illustration, but I will say that one thing that strikes me about this artwork is the amazing colors. The shading and highlighting on many of these pieces is quite dramatic and vivid, giving them a sense of richness that was only hinted at in the line art we had seen previously. 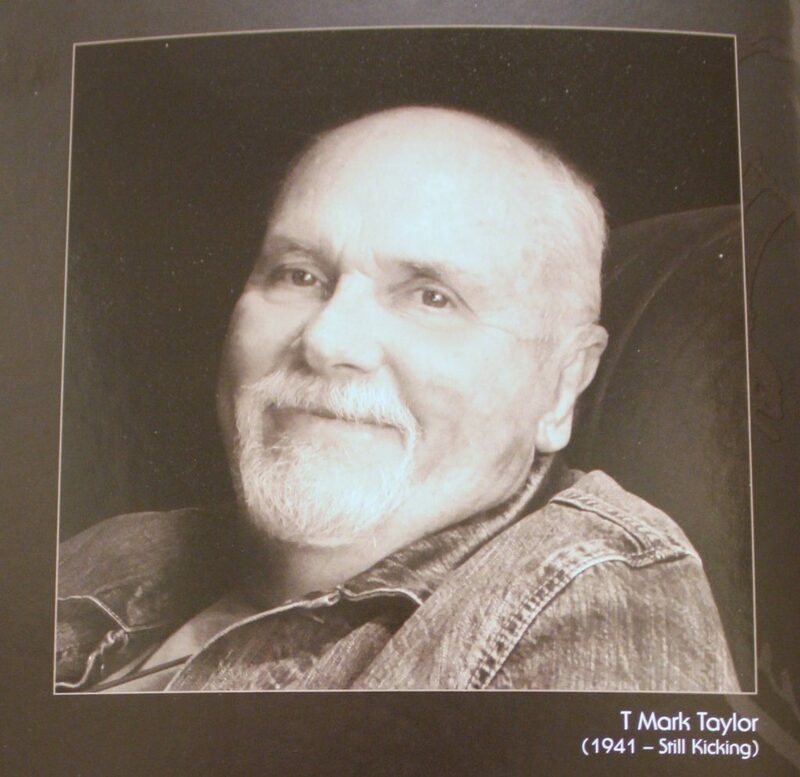 Mark Taylor has a unique and instantly recognizable style. Not every designer puts this much care and artistry into what are really preliminary designs, but I think this shows how invested Mark was in this concept. Each piece is dated 1981. 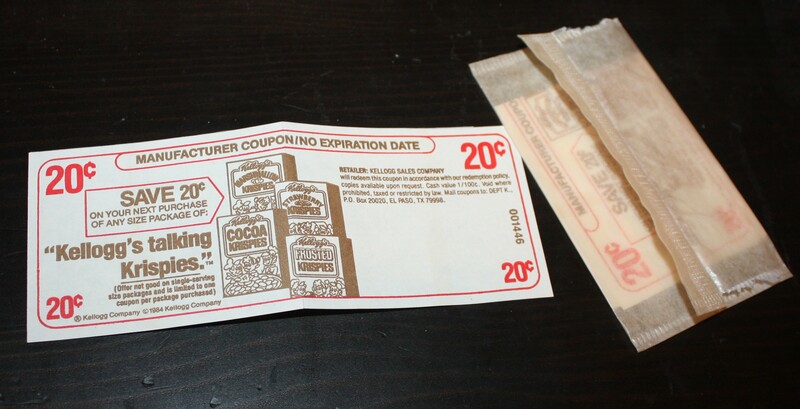 Some tell you the exact date on which they were created, while others give you only the year. For fun, I’ll go over the artwork in the order they are dated. I’ll make an educated guess about the ones without a specific date. 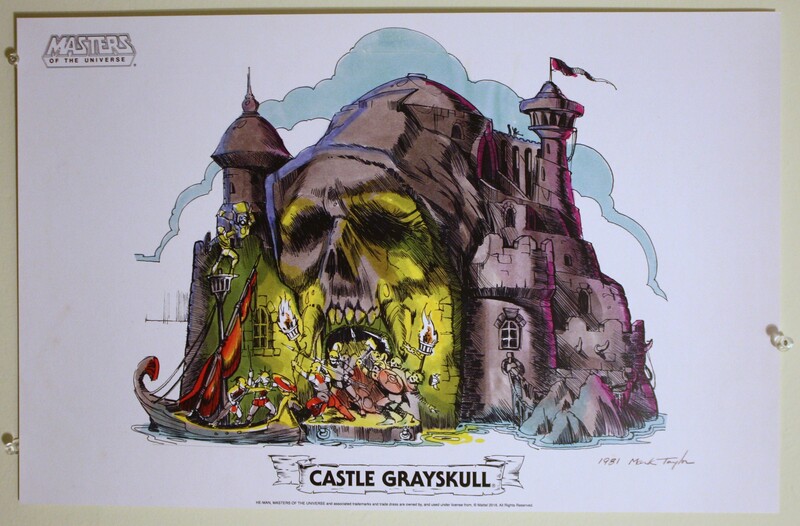 For years we’ve seen a partially-colored version of this concept, which was first hosted at the Grayskull Museum, beginning March of 2008. 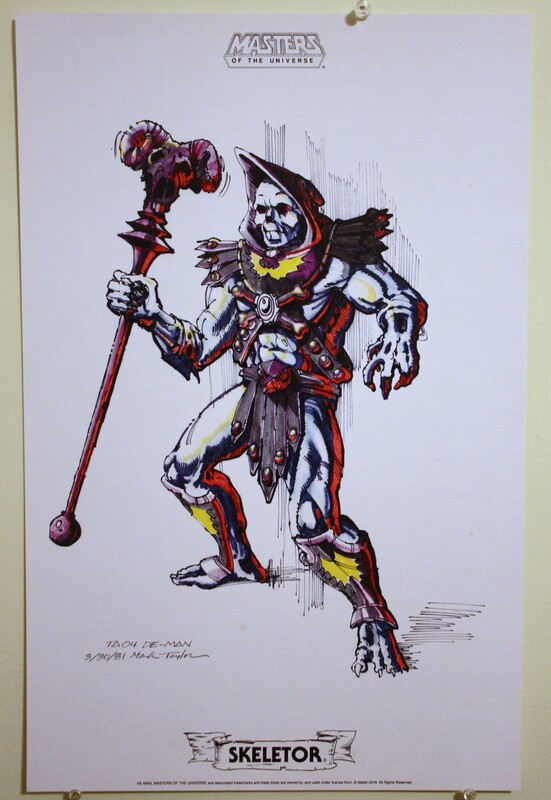 The Grayskull Museum has also displayed black and white B-sheet illustrations of Skeletor, Teela, Sorceress, Man-At-Arms, and others, which have been passed around by fans since that time. 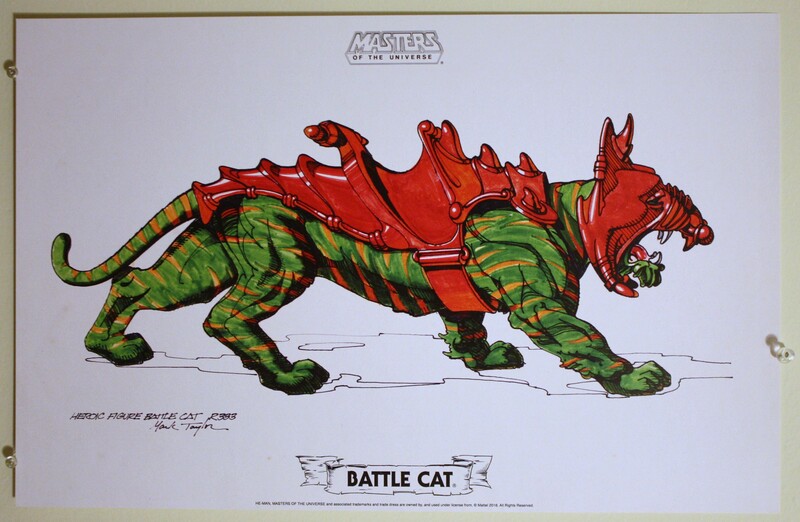 The Grayskull Museum’s version of the Battle Cat B-sheet is described as a color study. I would assume that means that Mark was testing out different colors before committing to any one color scheme. 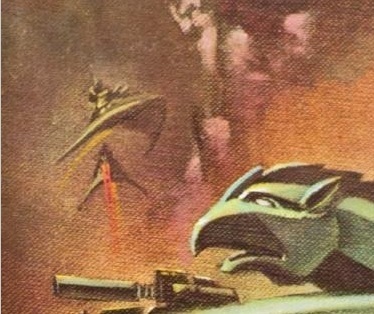 In the color study, there are some pink and purple shades incorporated into Battle Cat’s armor. 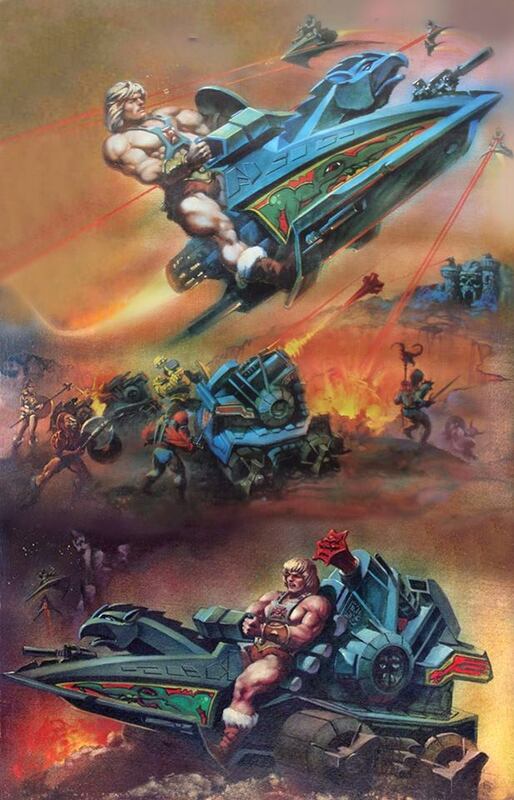 When Grayskull Museum asked Mark about the date of the image back in 2008, he said he believed it was done in 1979, although that may have been his best guess, as it doesn’t appear to be dated. 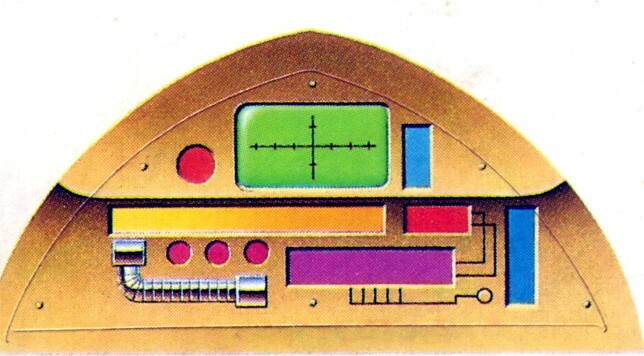 The illustration included in the Mark Taylor Collection is the final version, and it features the colors we’re familiar with on the vintage toy. 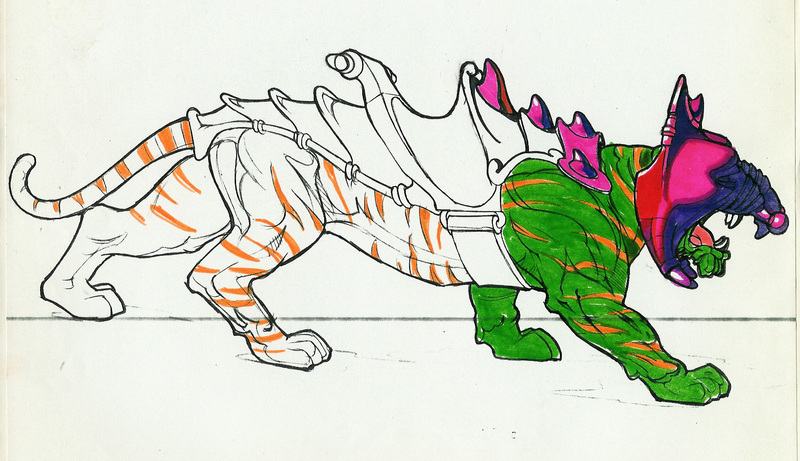 The tiger design is of course taken from the Big Jim tiger (or actually going further back, the Jungle Cat from Mattel’s Tarzan line), but Mark designed a saddle and helmet for the figure to make it work as a new toy for the Masters of the Universe line. 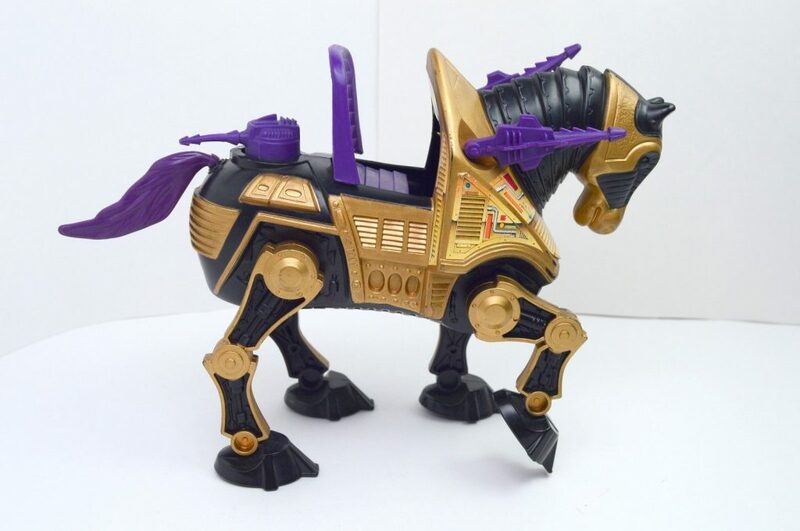 The shape of the saddle here is somewhat sleeker and swept backwards than its plastic counterpart, but otherwise the design is very close to what kids were playing with in the early 1980s. I had used the cat on the Tarzan line. 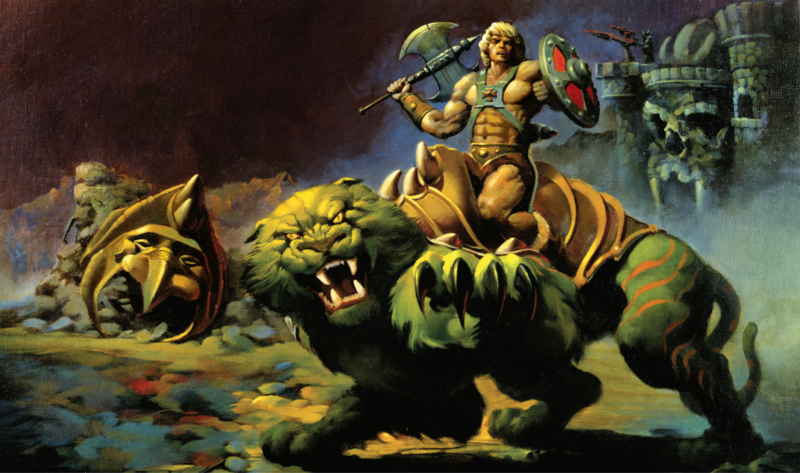 I liked the sculpt but the 5.30″ He-Man figures wouldn’t ride on him and I wanted him to ride on a huge cat. 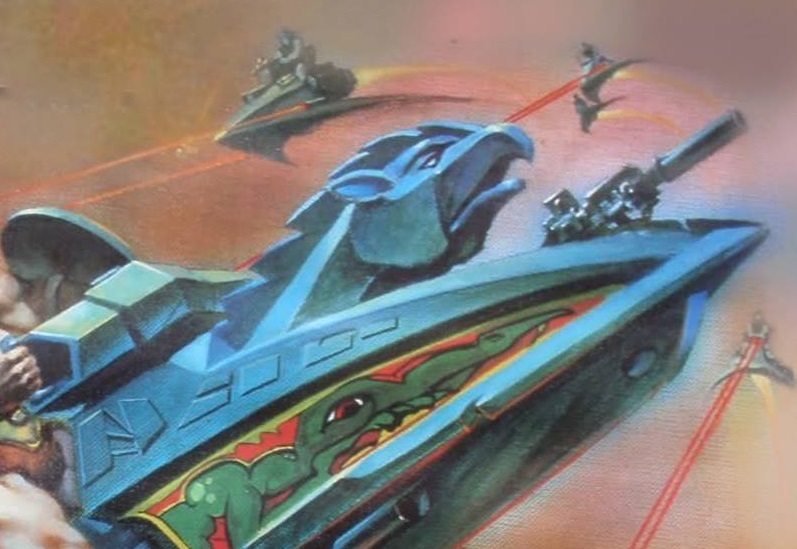 Nobody messes with a guy riding a huge armored cat! 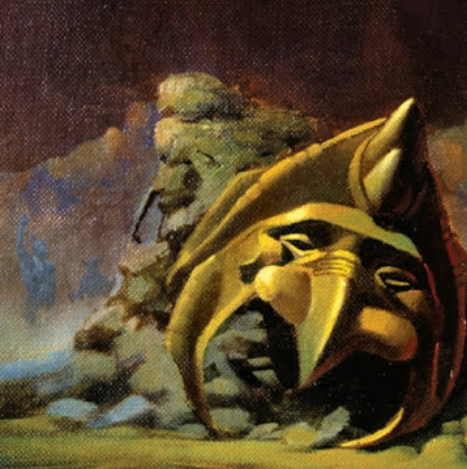 … The head armor came from my childhood sketches and had to be engineered for costs and molding ease, or the marketeers would lose it. 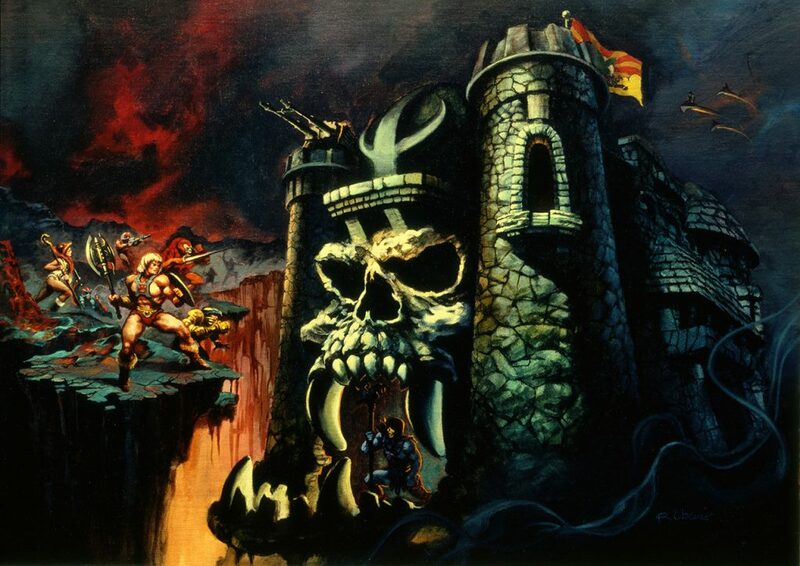 Mark called the castle the “Dwell of Souls” (the name Castle Grayskull was created by Don Glut, freelance story writer for the early mini comics). 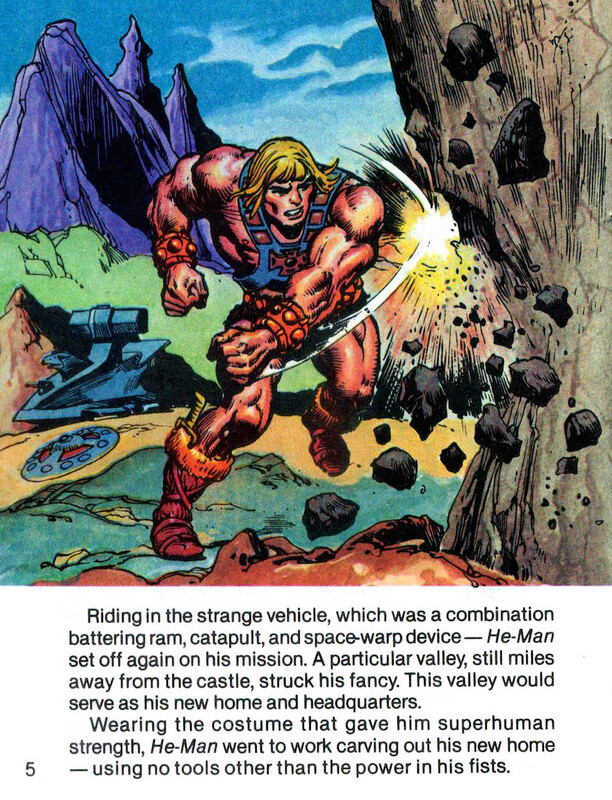 Mark has a complex back-story and mythology for Castle Grayskull and for the characters he created. You can read about some of that in my previous post about the castle. 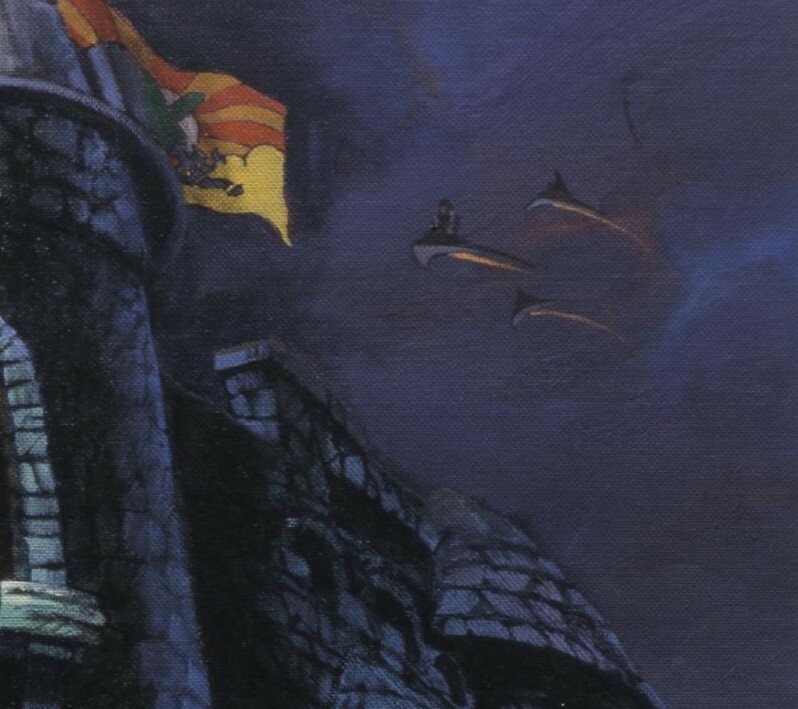 In the portfolio illustration, we see that the castle is surrounded by water (a “fetid lake”, as Mark describes it). The sides of the castle don’t much resemble the mass-produced playset, but you can see in the castle’s face many elements that were carried into the toy, including the elongated fangs and the asymmetrically-shaped cheekbones. 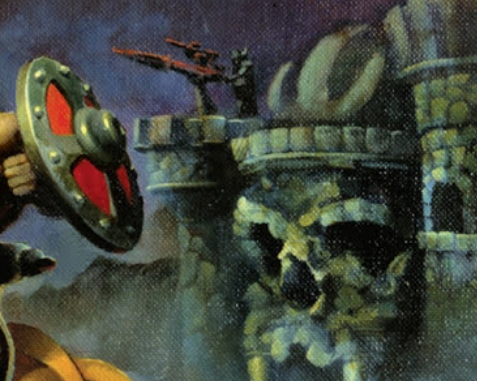 Interestingly, the face of this Castle appears to be hooded, and bears strong resemblance to Skeletor. 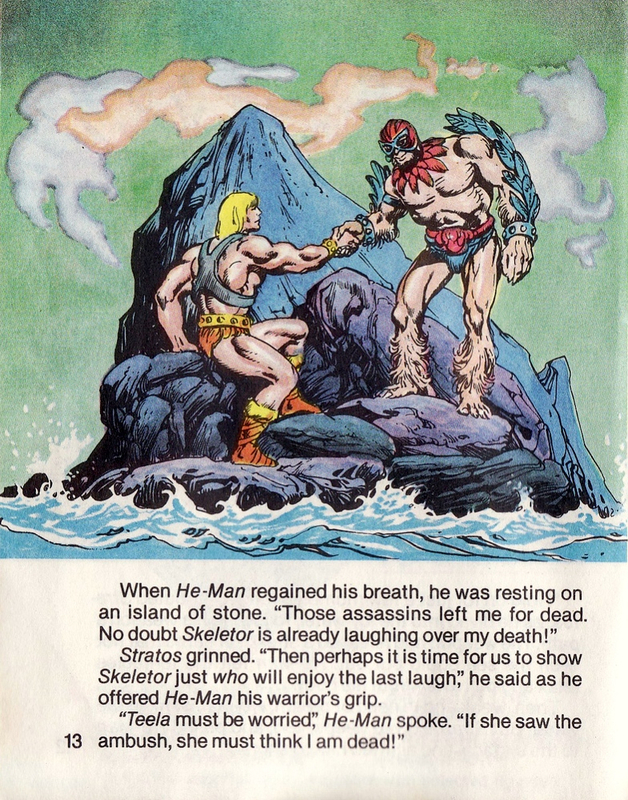 Fans may remember this exact illustration from the Art of He-Man book published by Dark Horse published in 2015. It’s nice, however, to have such a large version of it for display. 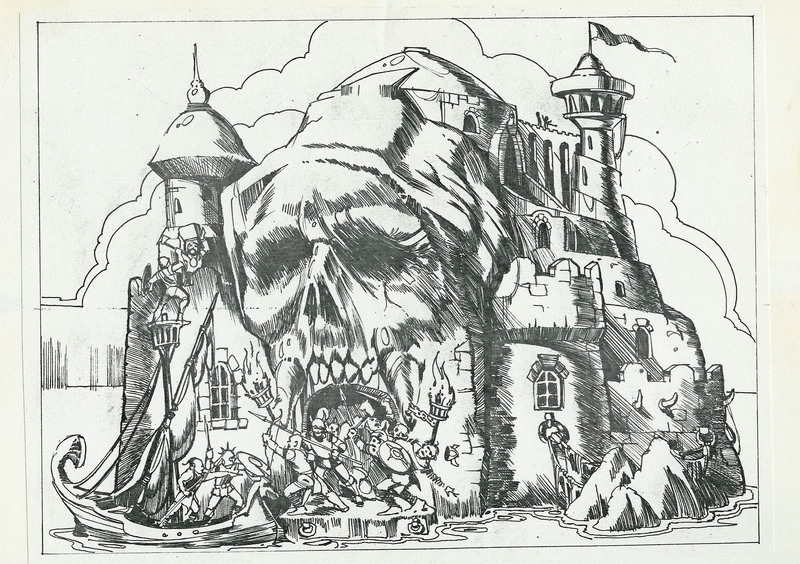 A black and white version also appeared on the Grayskull Museum website years ago. 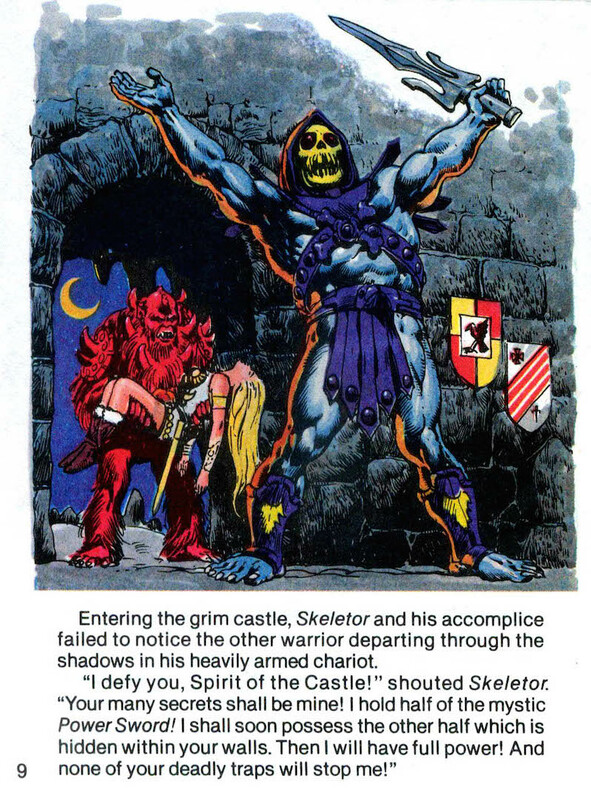 Skeletor, or “De-Man” (a play on the word demon and the name He-Man) as he is labeled here, is the earliest of the B-sheets that bear a specific date. The black and white version of this drawing (as discussed earlier) has been around for some time, but this is the first time most fans have seen a high-quality colored version. 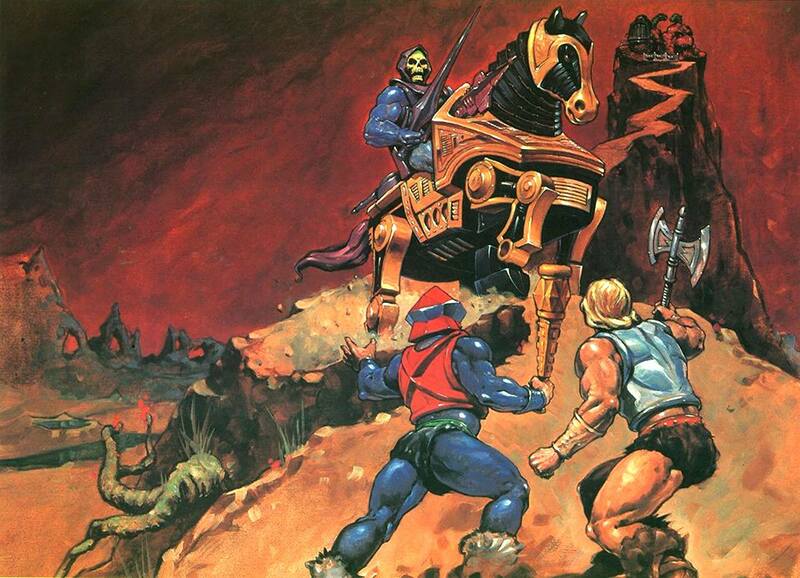 I absolutely love the use of color here, particularly the eldritch red lighting on Skeletor’s left side. 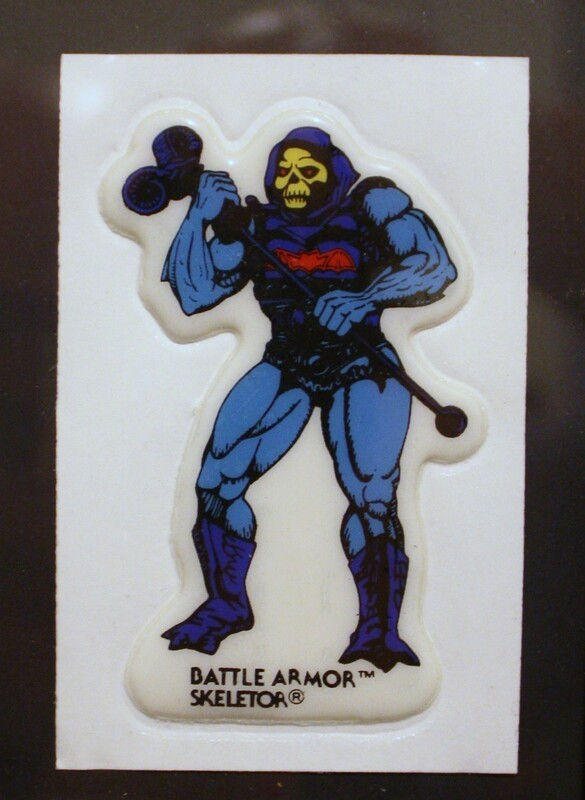 The element that most sticks out about this early Skeletor is the fact that he does not have a skull face. He seems to have more of an undead look, not unlike the ThunderCats villain Mumm-Ra (ThunderCats, of course, did not come out until four years later). 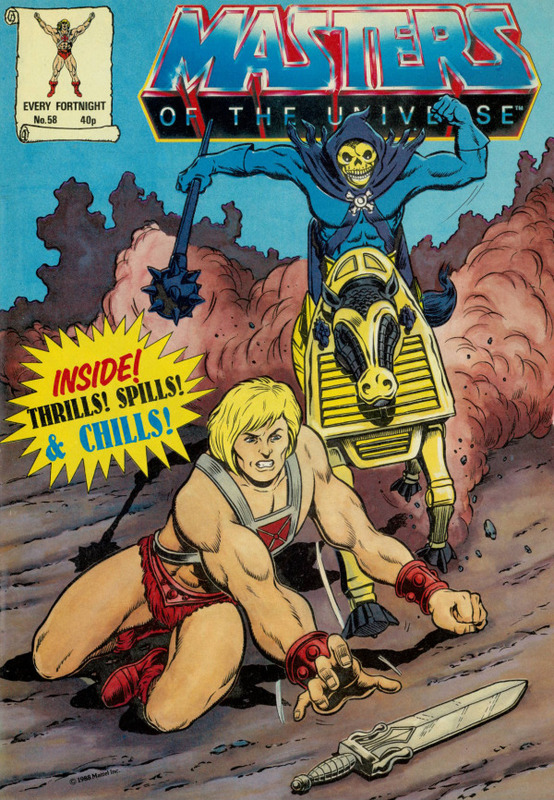 Almost everything else about this Skeletor will be familiar to fans of the early MOTU mini comics illustrated by Alfredo Alcala. 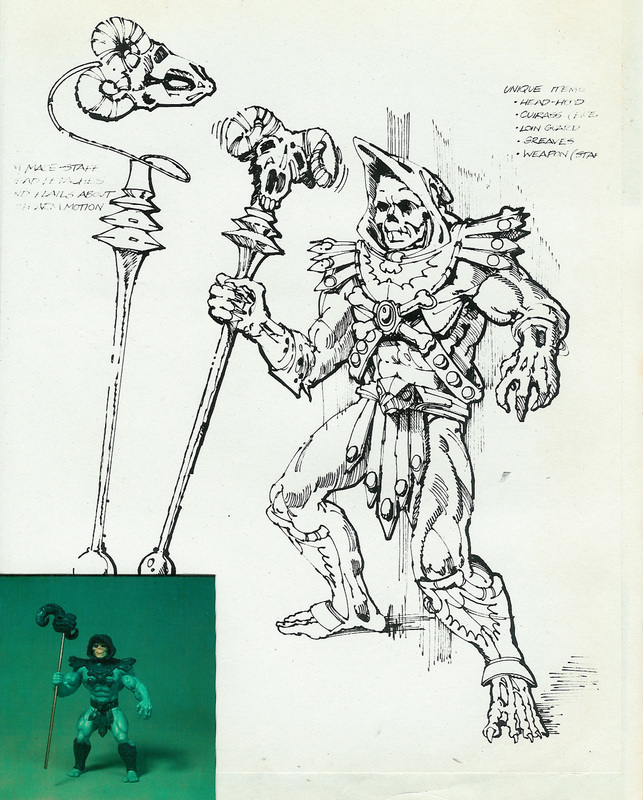 Other than the forearms and the face, Alcala’s earliest depictions of Skeletor are very closely based on Mark Taylor’s original design. He has the same bare feet, the same armor design with yellow bat motiff, and the same “commando” loin cloth (which is to say, he had no furry underwear underneath). 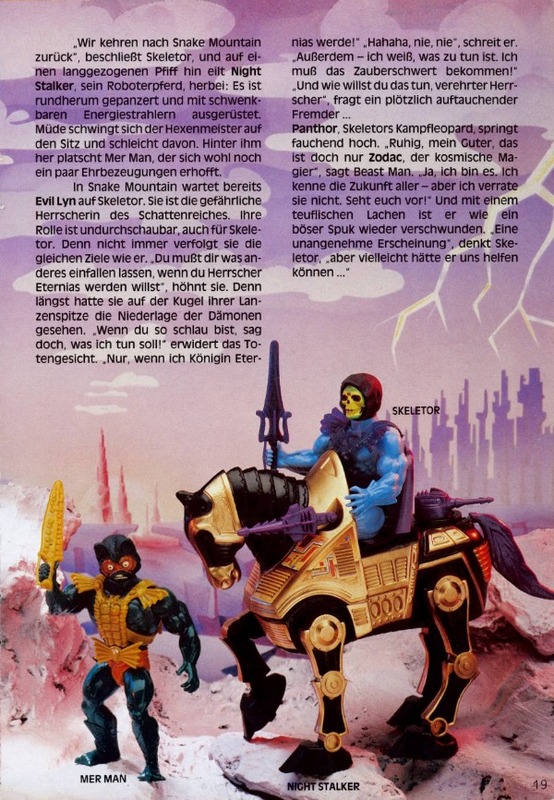 The design of Skeletor’s arms in the B-sheet is very interesting. The flesh of his forearms and hands seems to be decaying. There also appears to be some hanging skin towards the character’s elbows (unless I’m misreading the intent there). 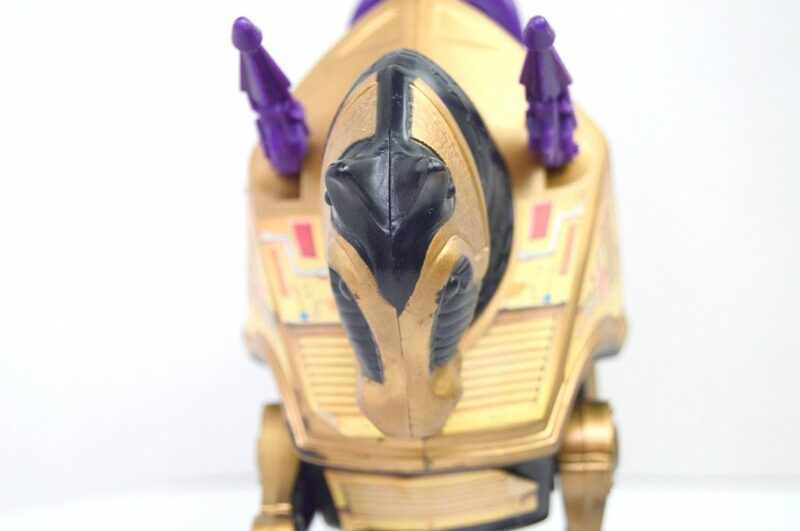 Looked at in another light, they almost resemble gloves, and indeed were interpreted as glove-like fins in later incarnations, such as the cross sell artwork and the mass-produced toy. 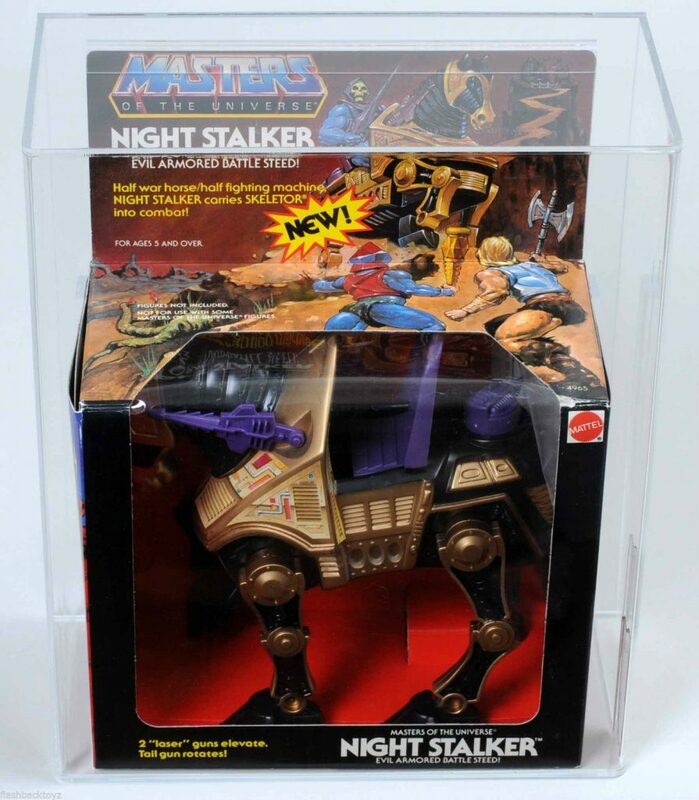 Skeletor’s pose here seems to have influenced the way the character was drawn in the cross sell artwork used on the back of packaging. The pose on the B-sheet design is a bit more dynamic, but otherwise the two versions cut the same profile. 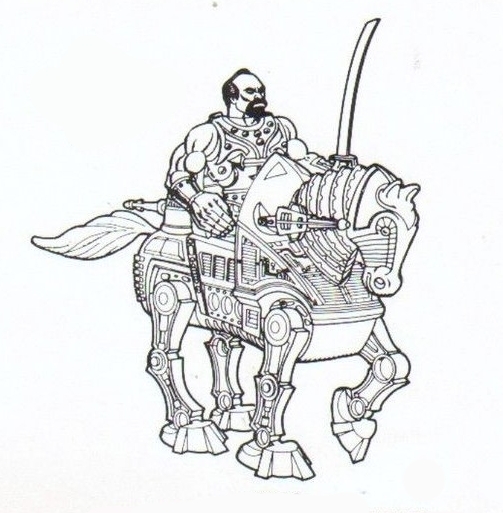 This concept Man-At-Arms is positively bristling with intricate wires, hoses, buttons, and miscellaneous alien devices. 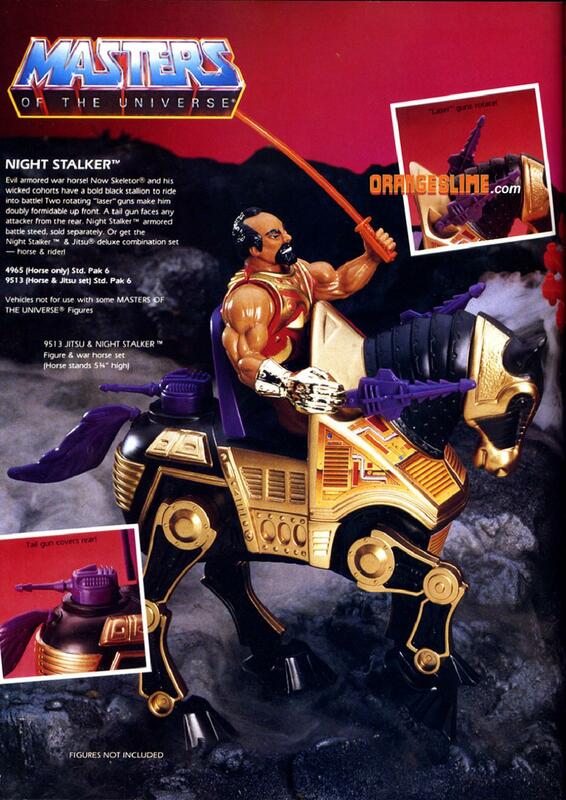 The colors used here don’t quite match any other depiction of Man-At-Arms that I am aware of. That is to say, most of the colors are similar to those found in the cross sell artwork (as is the pose to a certain extent), but the character here sports orange boots and orange fur around his chest armor. It’s clear to me that the color of his belt and helmet are supposed to be a metallic silver color. In artwork that can often translate as light blue. And indeed in many other incarnations his helmet and belt became more blue than silver. Speaking of his belt, you’ll note that Man-At-Arms features a squared-off belt buckle, unlike the circular design of the vintage toy . 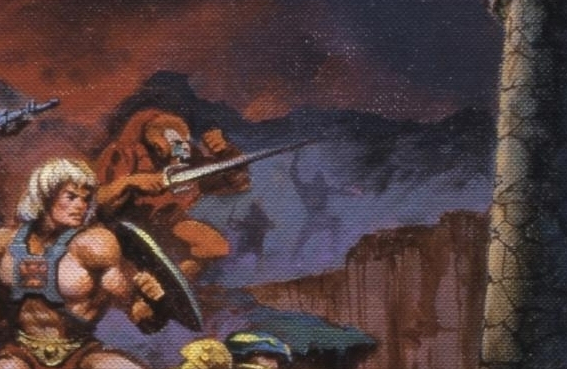 You can also see that the fur of his loin cloth peaks over the top of the belt. 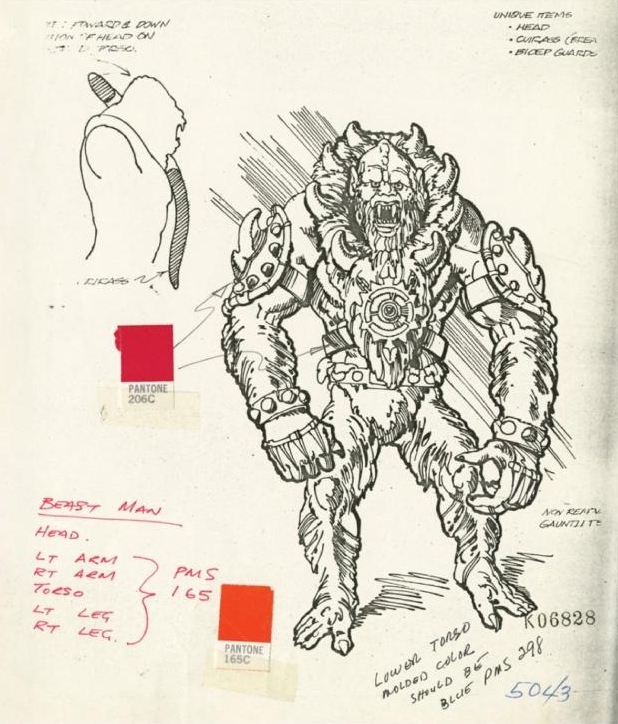 These details are repeated in the He-Man, Stratos and Beast Man B-sheet designs. 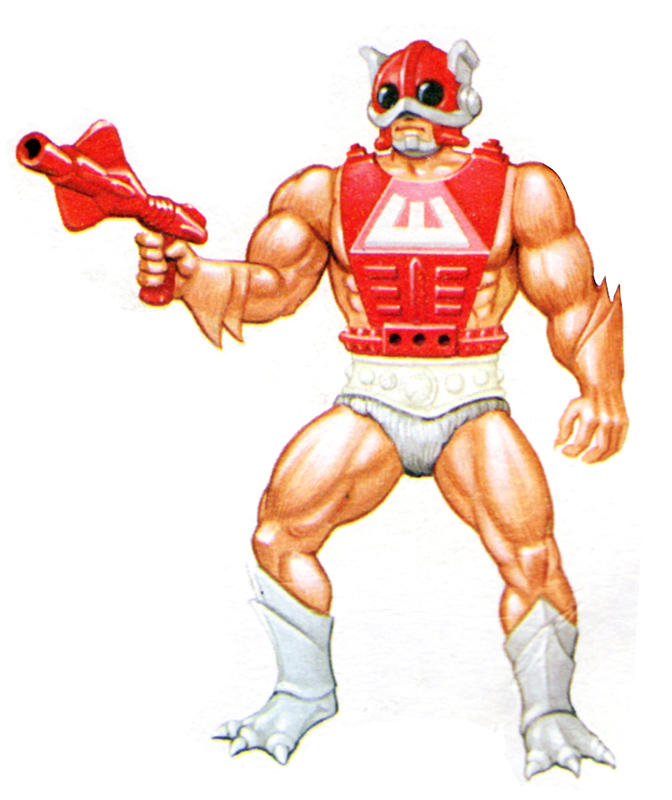 Man-At-Arms also features a knife tucked into his right boot, which he shares with the concept version of He-Man. These parts were clearly intended to be reused. Image courtesy of Axel Giménez. Note the black boots and black fur around his chest armor. 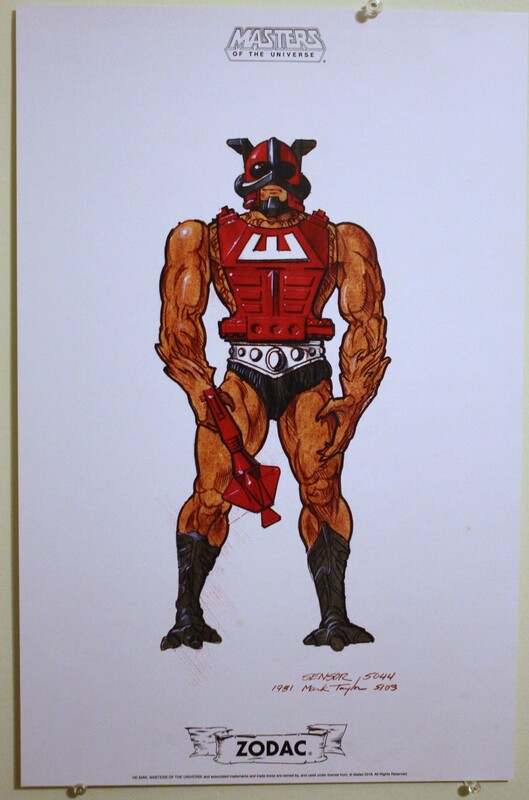 Mark’s Man-At-Arms concept drawing is one of my very favorites in this collection, which took me a little by surprise. 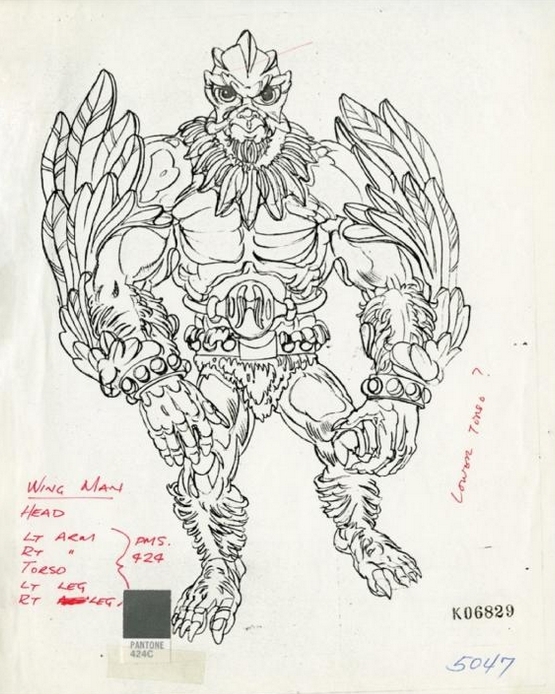 Beast Man, or “Tree Man” as he was originally called, is quite a visually striking figure. His colors are not quite what I had expected. 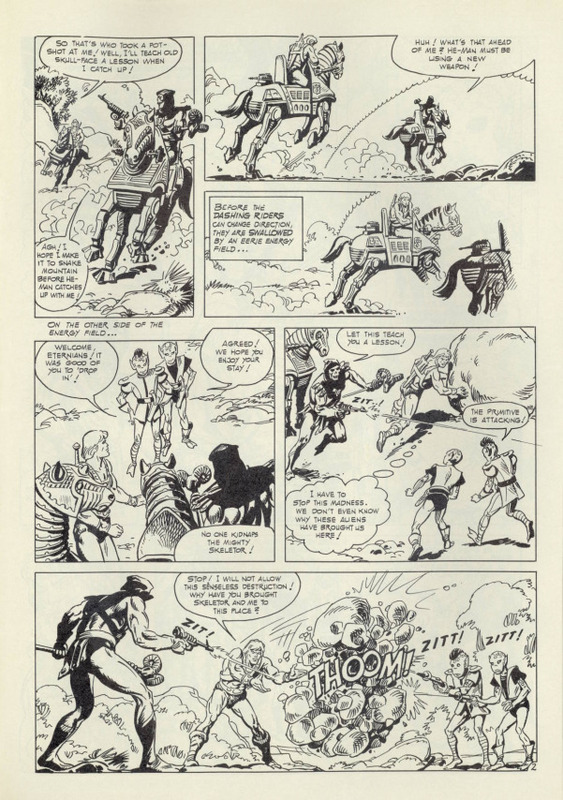 Generally speaking, Alfredo Alcala’s early mini comic artwork echoes quite closely Mark Taylor’s concept designs. 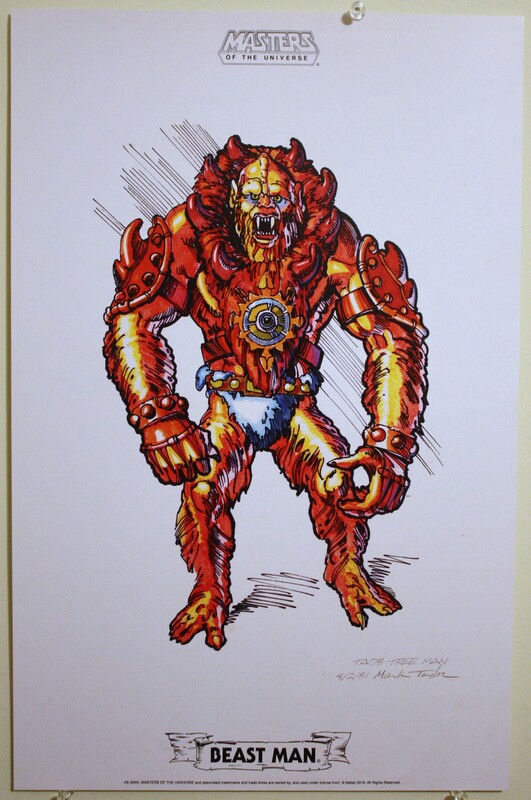 But his first Beast Man illustrations depicted a character who is entirely red, with only splash of yellow on his armor to break up his monochromatic design. 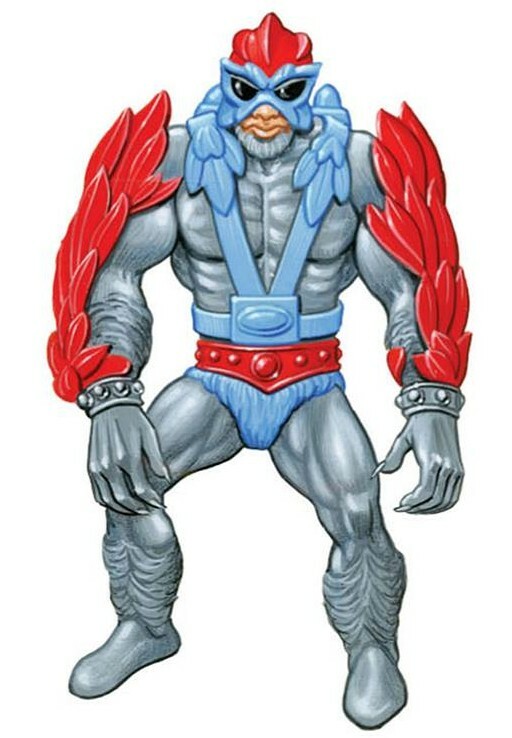 Contrary to expectation, this version of Beast Man has a blue loin cloth and blue detail on his armor and around his eyes, very much like the vintage figure. 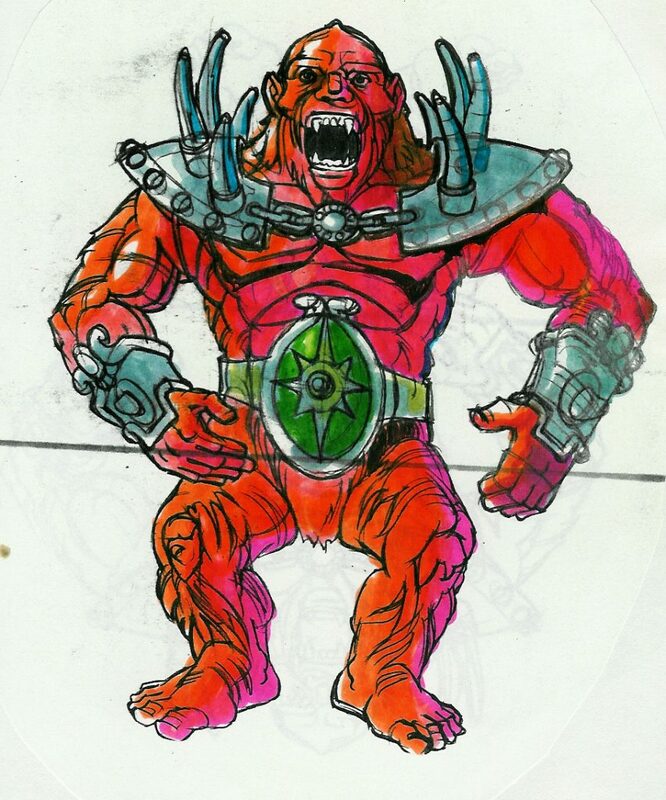 There are other earlier incarnations of an ape-like or bear-like henchman character that appeared in monochromatic red. 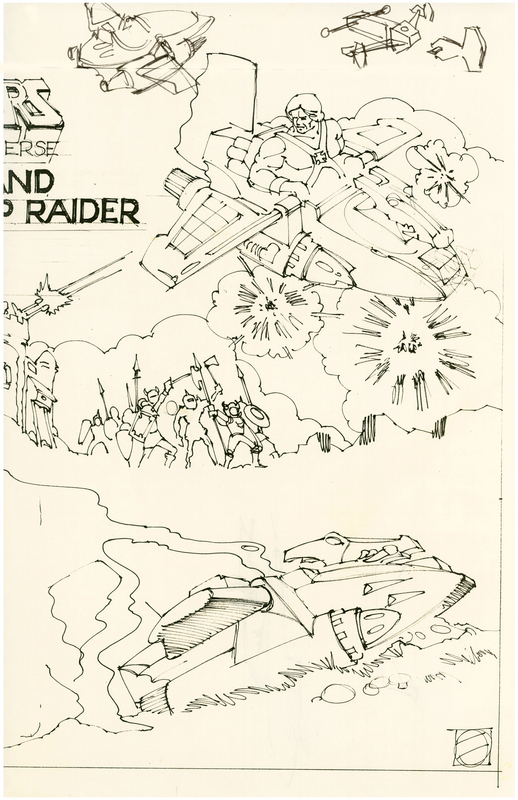 It makes me wonder if there wasn’t an earlier version of this B-sheet at some point that was colored that way. In any case, this version has somewhat ambiguously-colored fur. There is quite a bit of highlighting and shading going on that gives his fur a somewhat orange look on balance. But I believe the intent was for him to have a much more reddish-orange color. 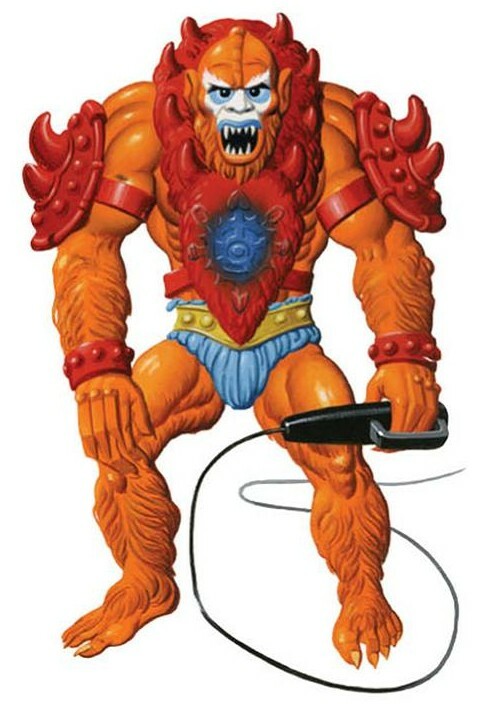 You might have noticed that Beast Man carries no whip here. 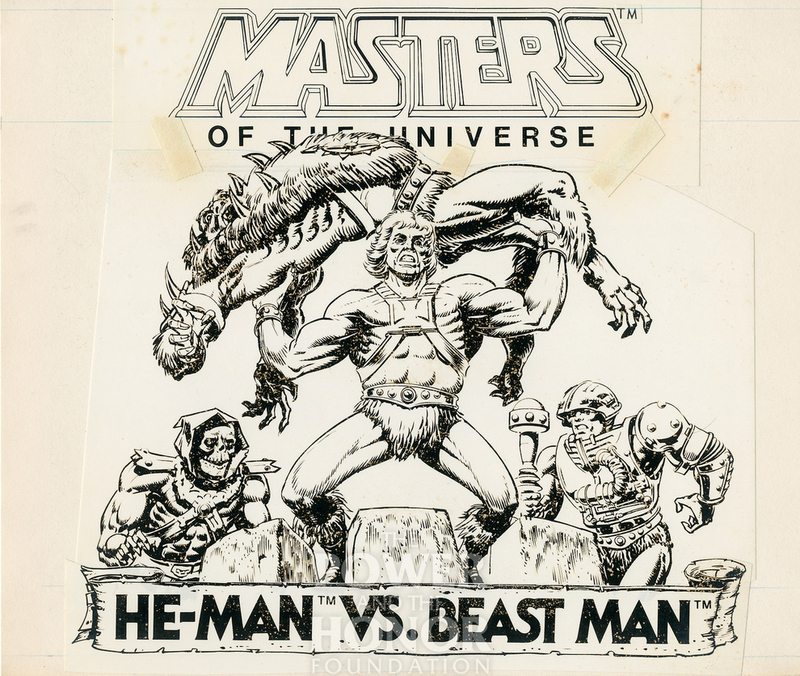 That is also true of Beast Man as he is depicted in the early mini comics as well. 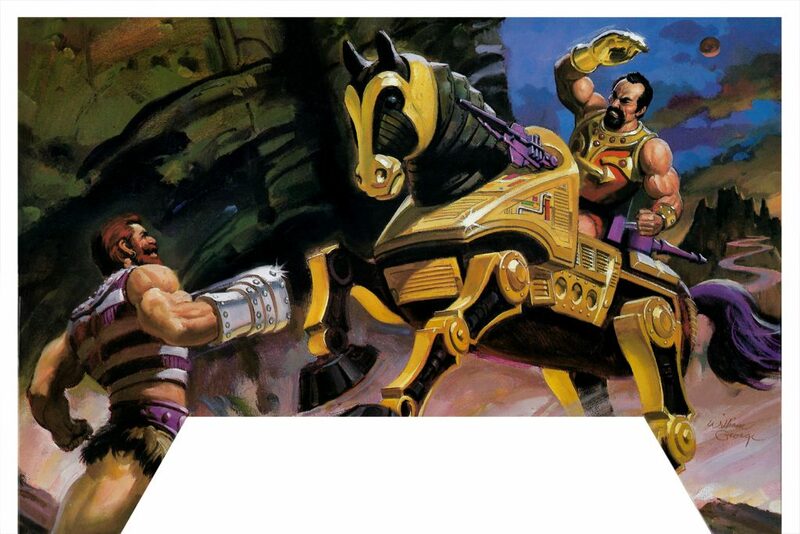 Given that the whip was borrowed from a Big Jim action figure, it may have been something of an afterthought. 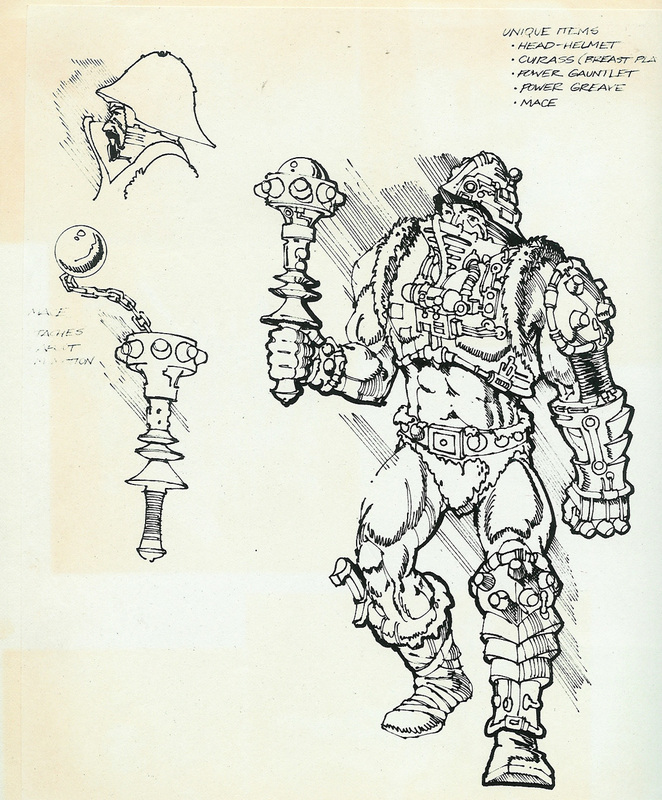 The pose used in Beast Man’s cross sell illustration (above) is almost identical to Mark Taylor’s concept version. The most powerful man in the universe is indeed quite powerful looking in this B-sheet design. This is another case where I was somewhat surprised at the colors when I first saw them. He sports tan and red boots, red and silver gauntlets, and a plain gray shield. 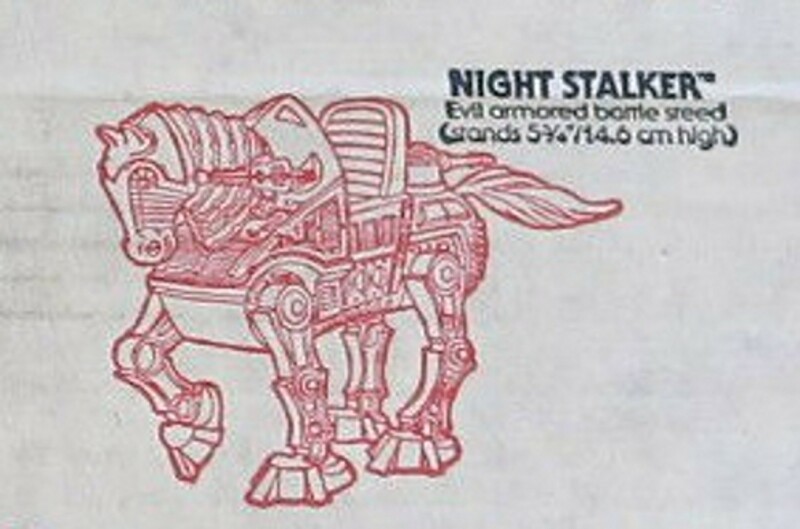 I was already familiar with a later version of this design (dated May 3, 1981) that had a different color scheme altogether. 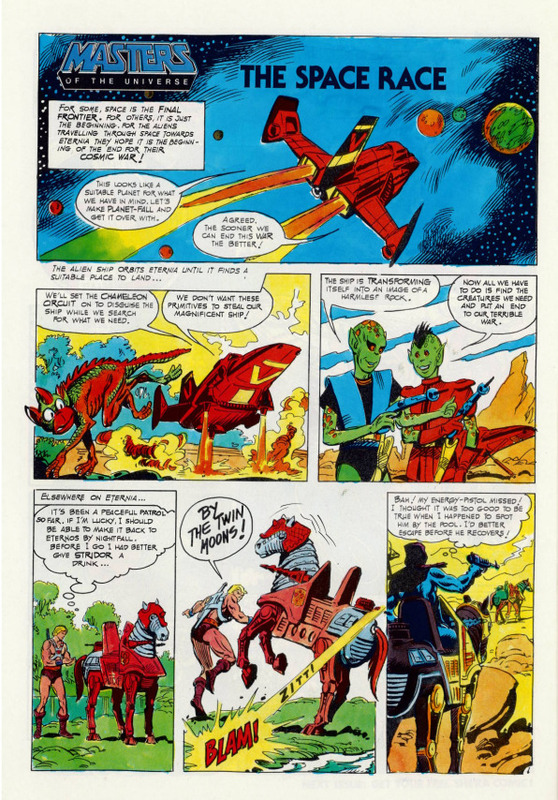 That color scheme will again be familiar to fans of the early Alfredo Alcala mini comics. 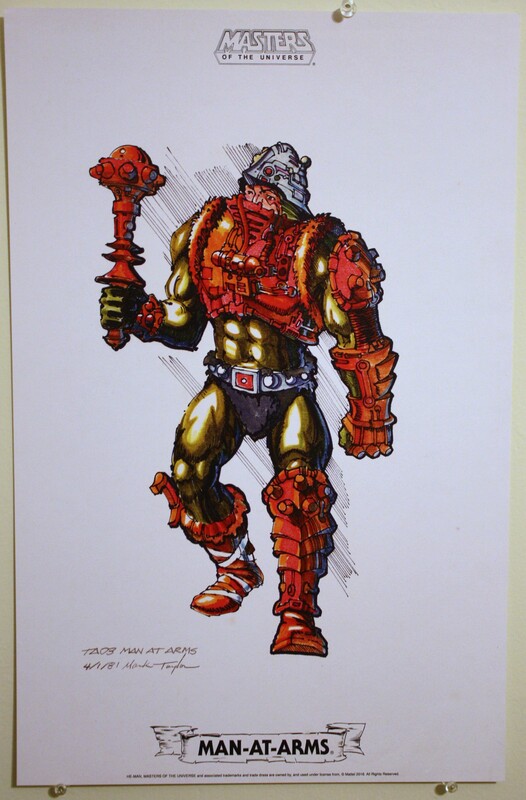 He-Man has two-tone red and ocher boots (with boot knife), orange gauntlets, and an orange and gray shield. This version also has orange details on the straps of his armor, rather than the red used on the final design. I must confess that the May 3 version is actually my preferred version – I think the colors are perfect here. Perhaps it will make an appearance in part 2 of this portfolio, should one be offered (which is my not so subtle way of lobbying for a sequel). 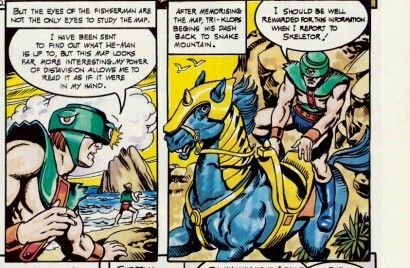 Probably the detail that will stick out most to He-Man fans is his helmet. 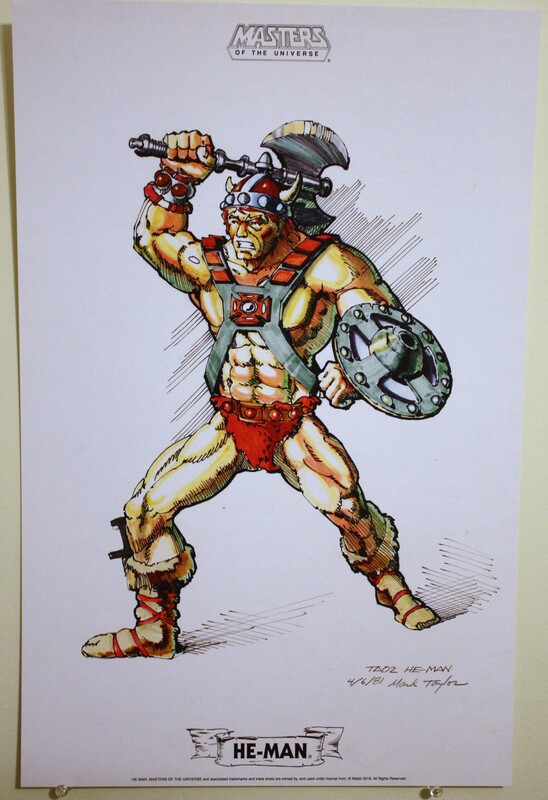 This was of course dropped in the final toy, but the presence of this helmet really punctuates the original barbarian concept of the character. 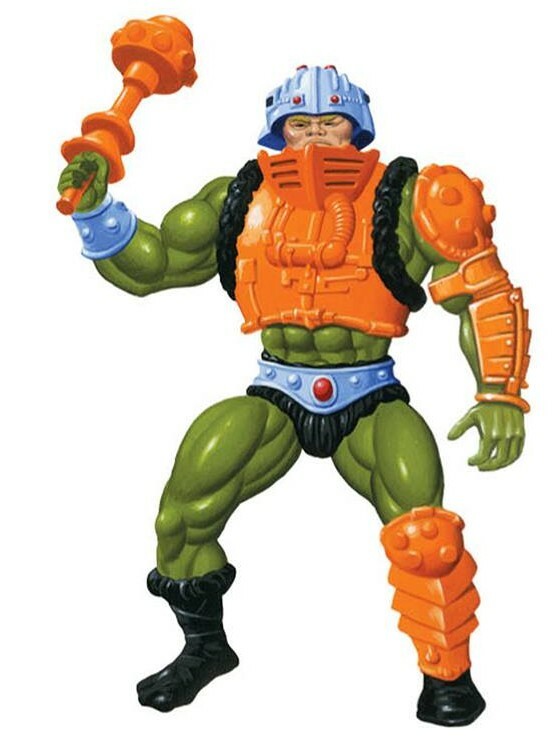 In time He-Man came to be depicted as almost Superman-like in his personality and abilities (with a Clark Kent-esque alter ego to boot), but it’s pretty hard to think of him like that with this helmet on. Personally I love the look here and would love to see some version of this design made into a figure or a statue. Really that goes for all of the figure designs in this portfolio. 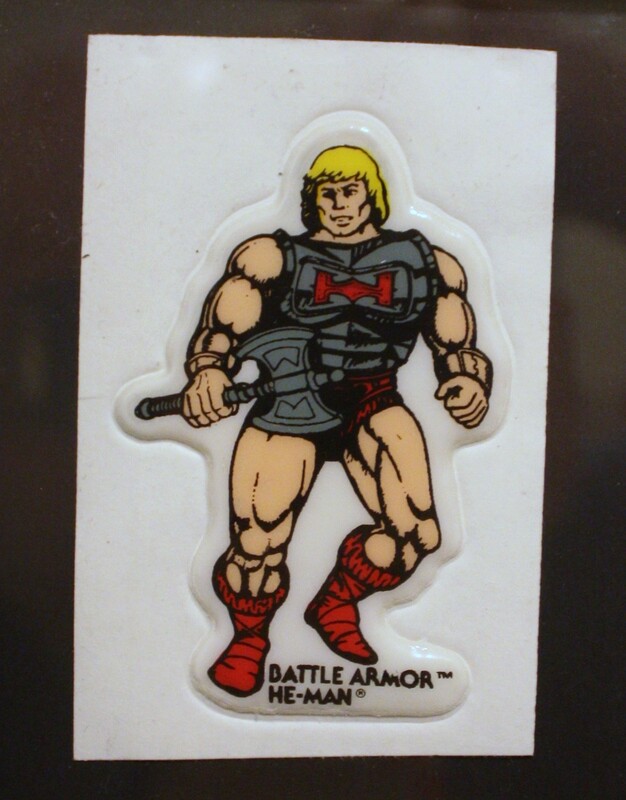 You might notice that He-Man does not carry a sword. The axe was his original weapon, and the sword was added later. This particular axe also found its way into the early mini comics. 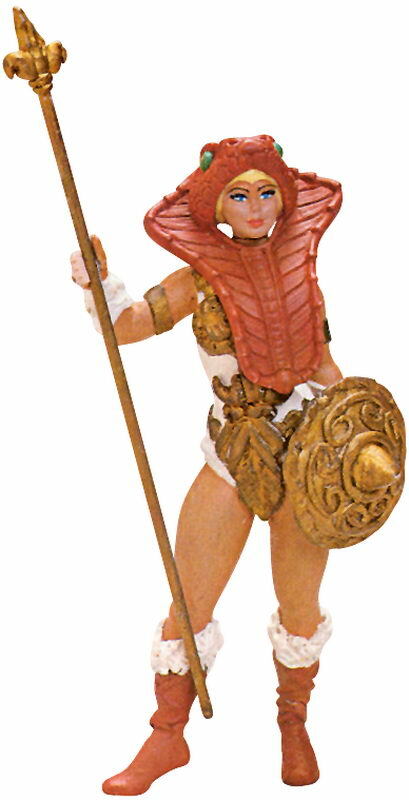 Teela without her collar/overlay piece (which ended up being a permanent part of the toy, rather than an accessory), by Mark Taylor. Image source: Rebecca Salari Taylor. 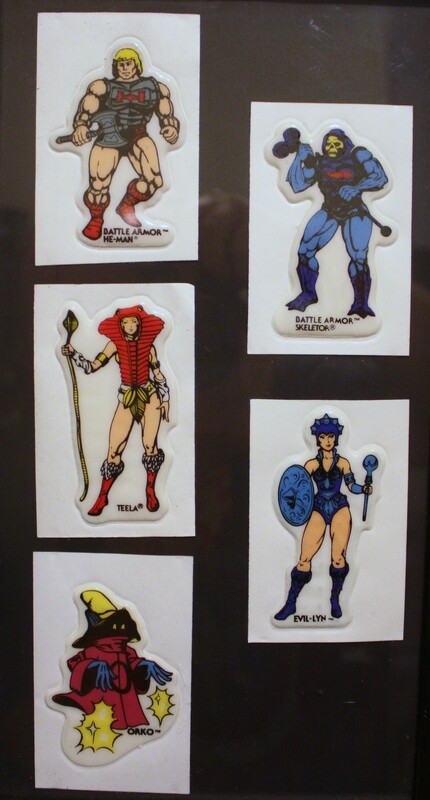 As mentioned previously, the colors for Teela (here called simply “Female Warrior”) were restored using prototypes and early mini comic artwork as references. 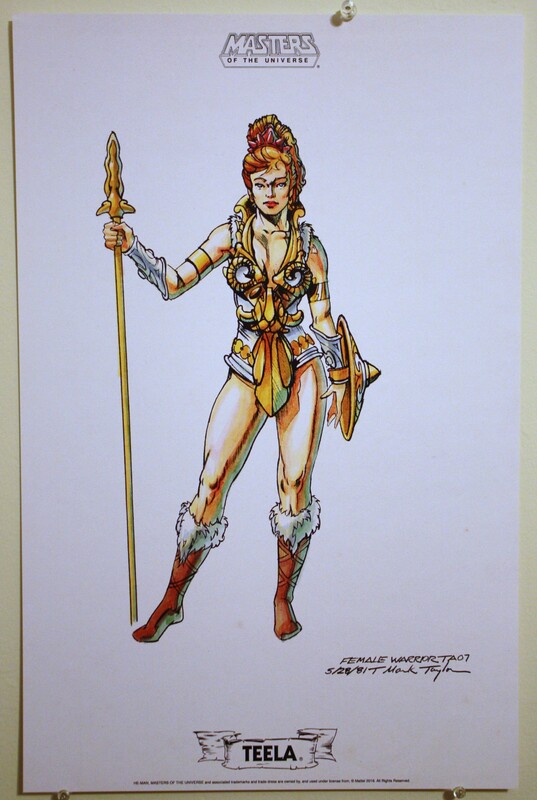 Once again fans of early Alfredo Alcala mini comics will recognize this incarnation of Teela with her blonde hair, spiky red tiara (which was based on a hair accessory owned by Mark’s wife, Rebecca), two-toned brown and white boots, and exquisitely detailed gold and white costume. 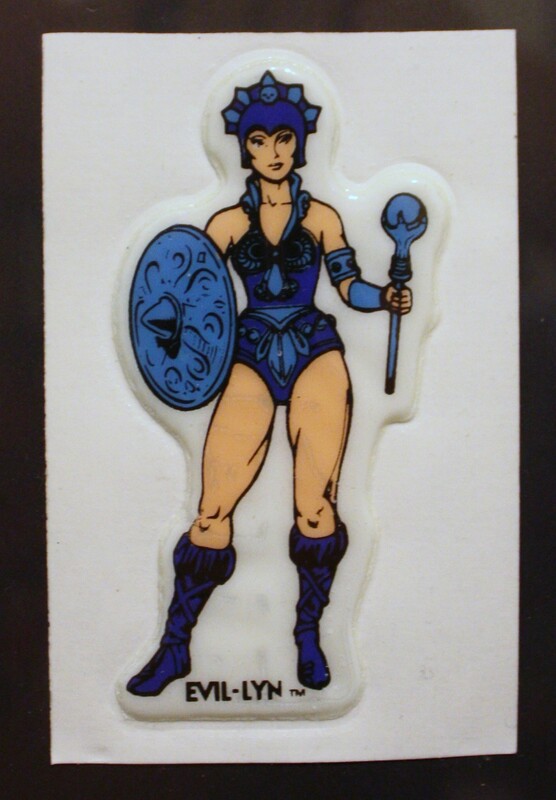 While Teela’s gold and white shield shows up in the Alcala artwork, her spear, as it appears in this illustration, does not. 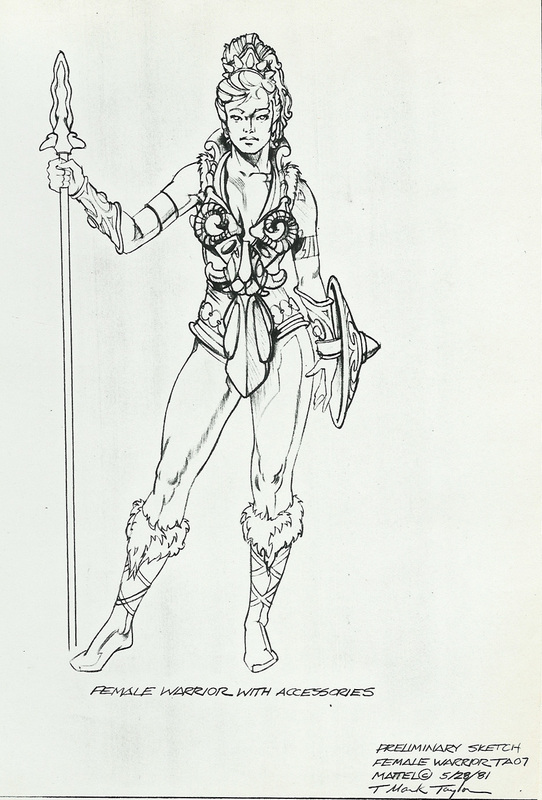 A similar spear does show up in an early prototype of Teela. This prototype of course features the snake armor that was originally intended for Mark Taylor’s Sorceress character. 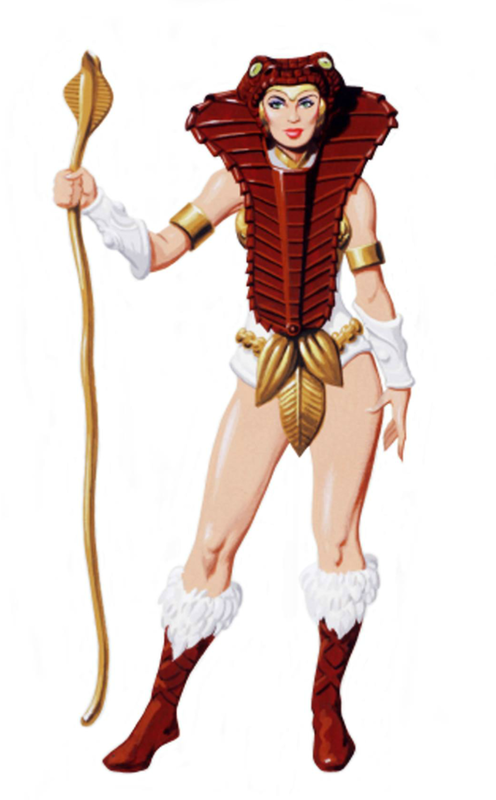 Teela’s posture in Mark Taylor’s B-sheet is nearly identical to her posture in the cross sell artwork, although again by that time her design had been cross pollinated with the design of the Sorceress. 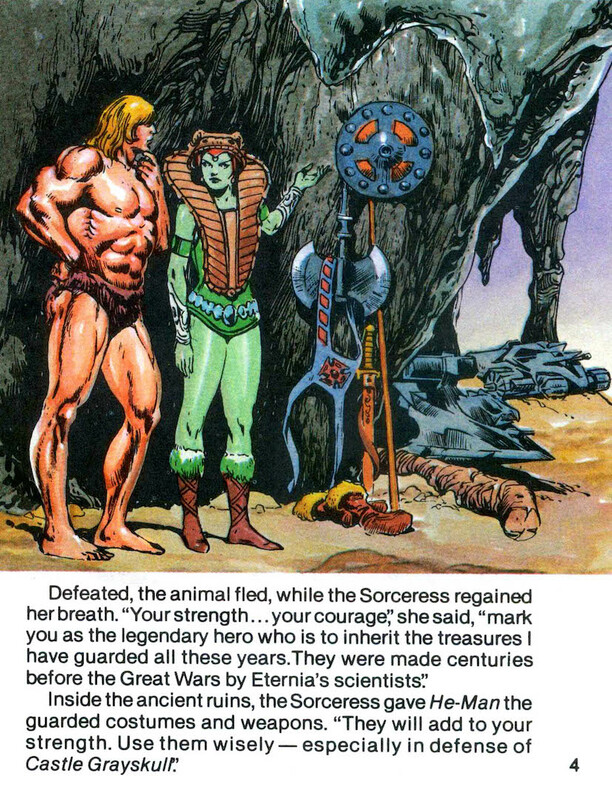 I don’t think any incarnation quite captured Teela’s face as Mark drew her. 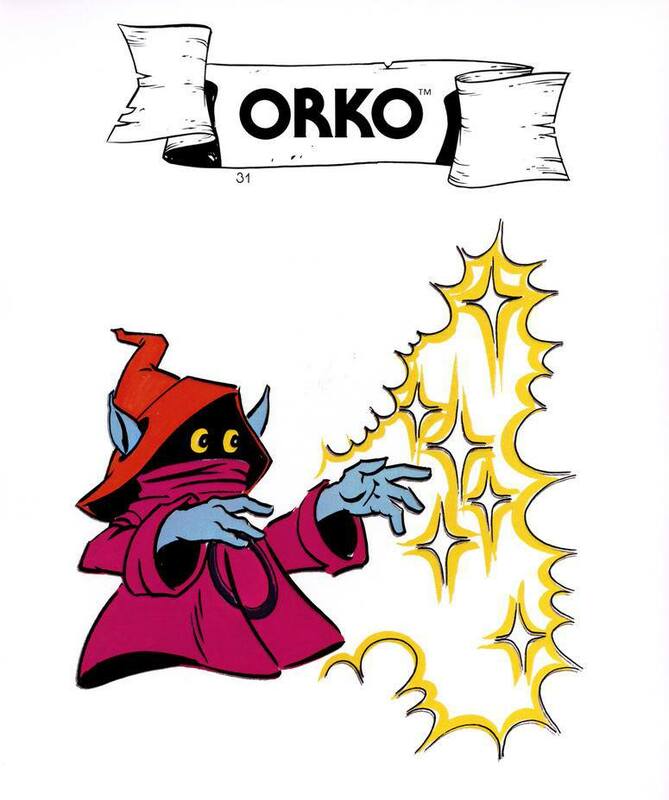 The artwork in this portfolio does not give an exact date for the Sorceress, but a black and white version that has been circulating for a number of years is dated June 3, 1981. 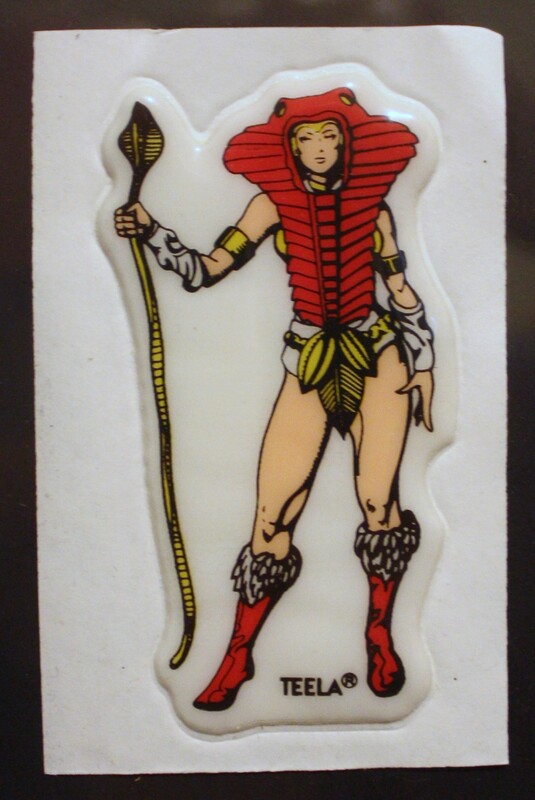 The Sorceress’ form is in many details identical to Teela’s. She shares the same legs, arms, and basic outfit. 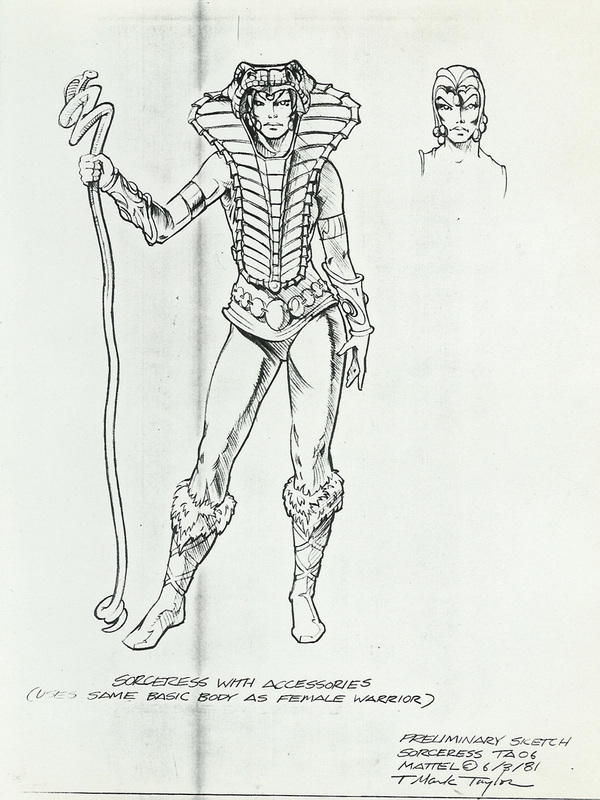 As Emiliano Santalucia has explained, the idea was that the Sorceress would reuse Teela’s body. 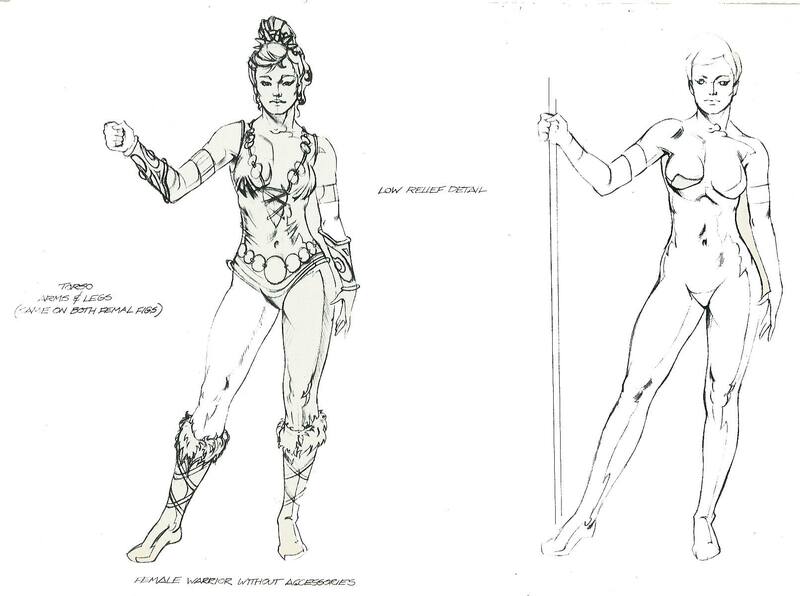 However, the gold detail going up and down the front of Teela’s costume, in addition to her gold collar, was actually intended to be a removable piece. The Sorceress’ design omits that overlay and instead gives her a cobra-themed headdress. 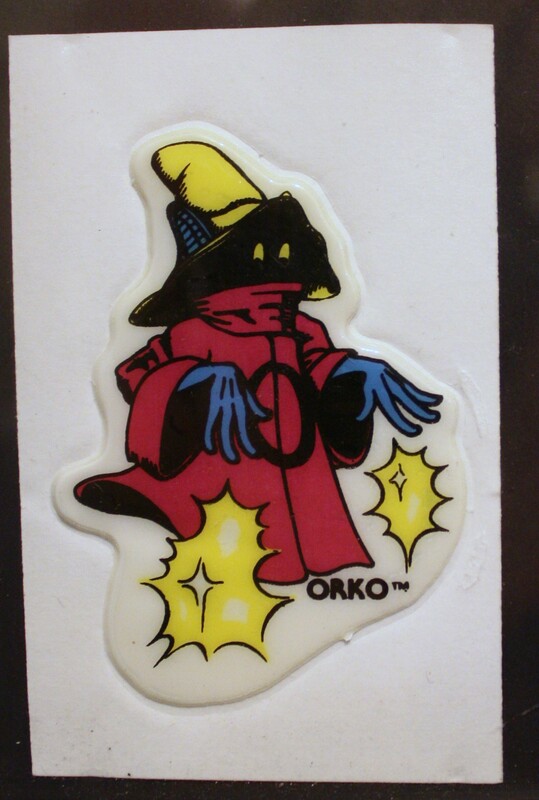 This character is again familiar to fans of the early mini comics. 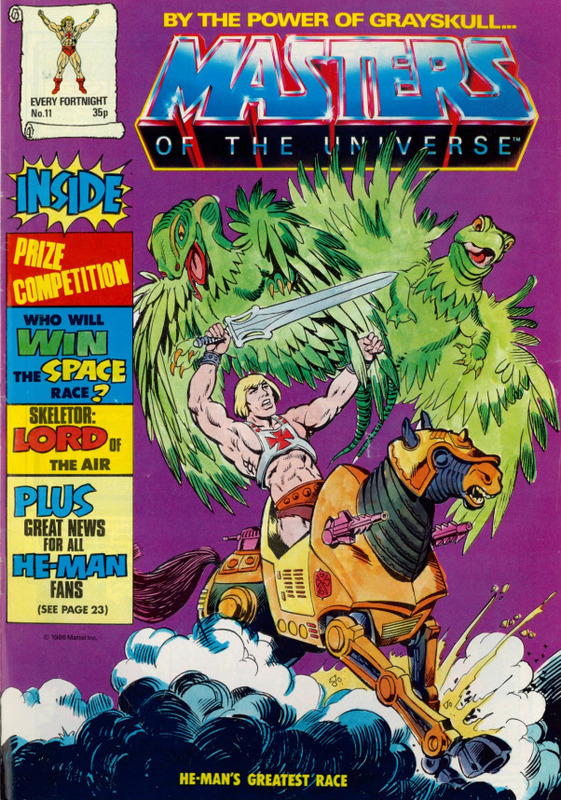 This green Sorceress (commonly referred to as the Green Goddess now) shows up only in the first mini comic – He-Man and the Power Sword. 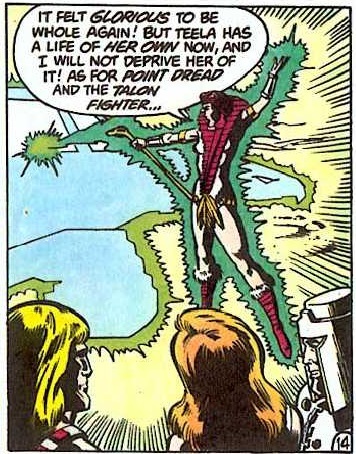 One crucial difference between the comic and the original concept is that the comic depicts Sorceress as having green skin. 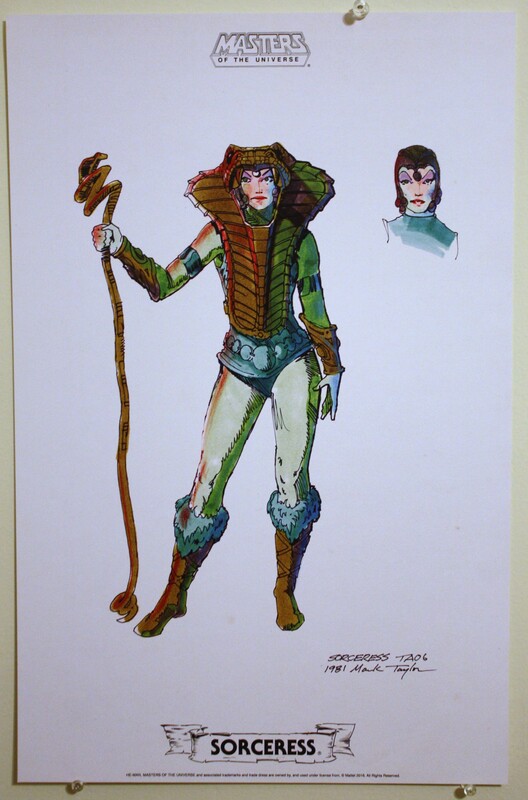 In Mark Taylor’s original concept, she is wearing some kind of green body suit, not unlike Man-At-Arms’ costume. 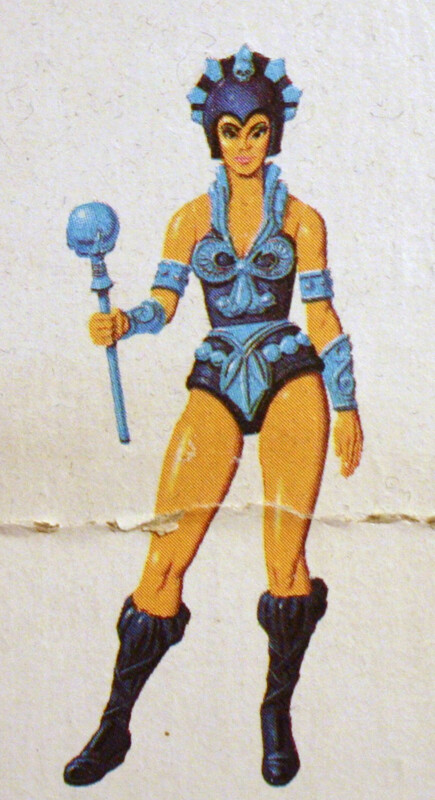 It’s a shame that this version of the Sorceress was never released in the vintage line – she’s a striking-looking design, and frankly the toyline could have used more female characters. According to Mark, Sorceress was intended to be a kind of double agent and a changeling. 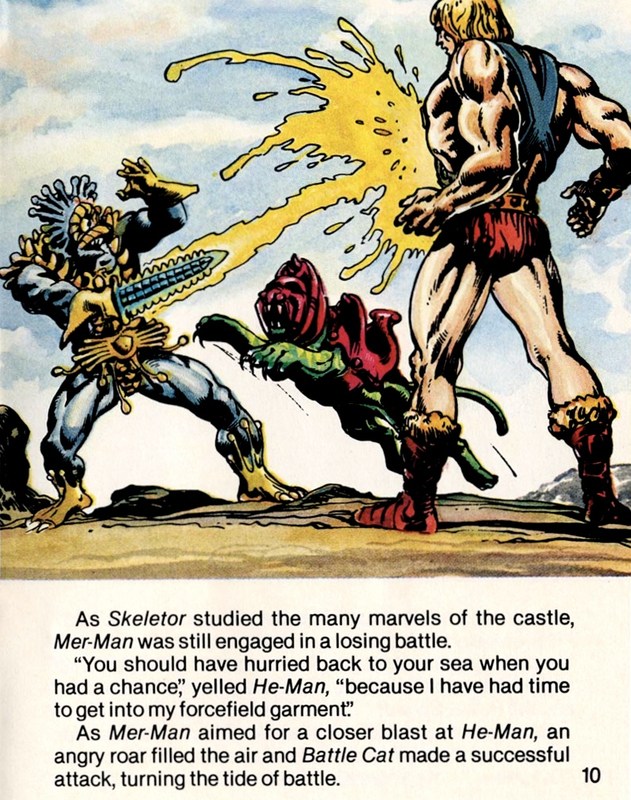 Of all of the wonderfully vivid and creative illustrations in this portfolio, Mer-Man is my hands down favorite. 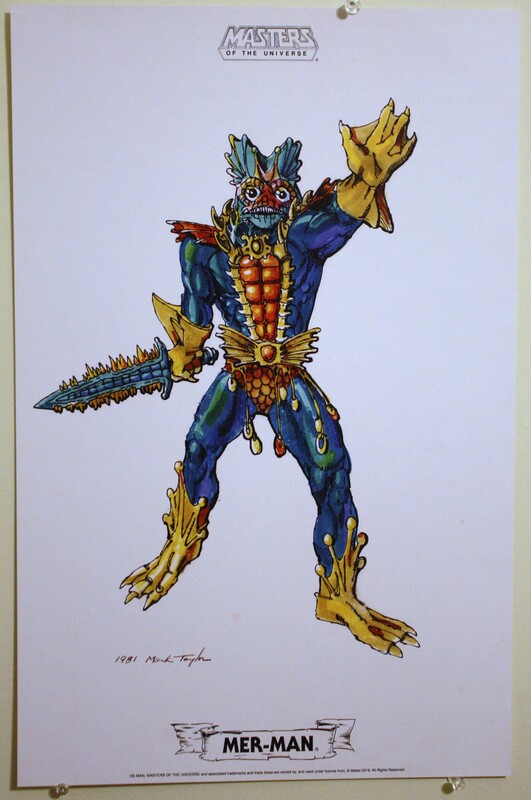 In no other media has Mer-Man ever appeared so highly detailed or so rich with color. 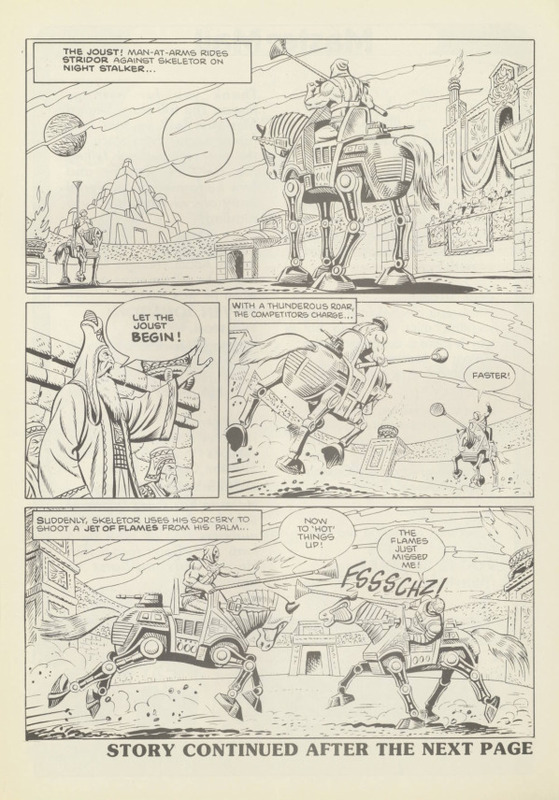 The closest version we have seen to Mark’s original vision was again in the early mini comics illustrated by Alfredo Alcala. 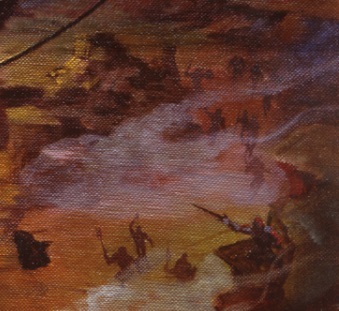 Even then, Alcala simplified the colors and some of the detail (primarily in the colors of his clothing and face – Alcala omitted the copper accents and simplified the shape of his gloves). I’m particularly pleased with the range of blues and greens appearing on Mer-Man’s skin. This design is practically begging to be translated into a toy or a statue. 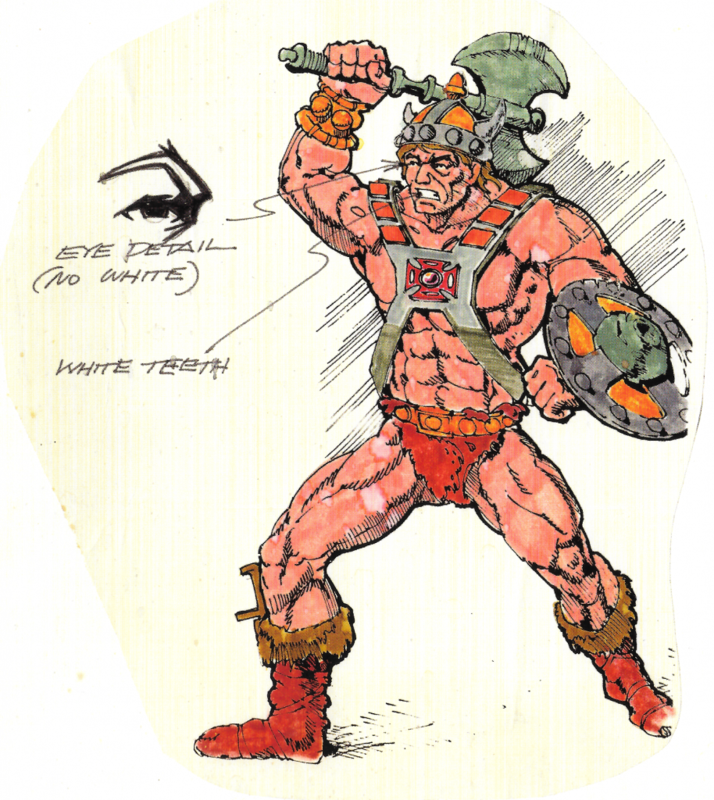 The cross sell artwork is very much based on Mark Taylor’s original design (including the pose), although the limbs are simplified and his chest armor is significantly widened. 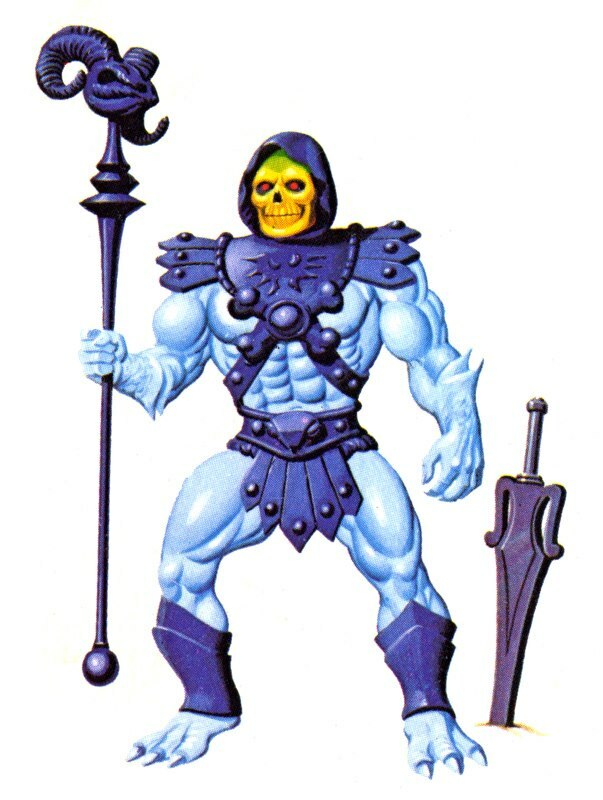 His skin color was also made much greener, perhaps to move him further away from Skeletor’s skin tone. 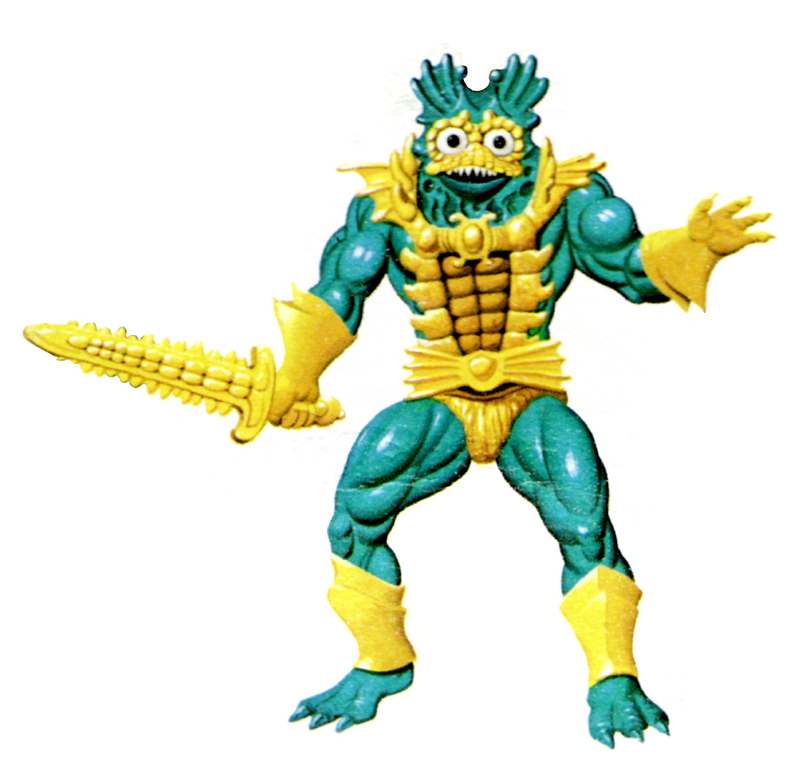 In his original form, Mer-Man would have required 100% new tooling and molds to produce. 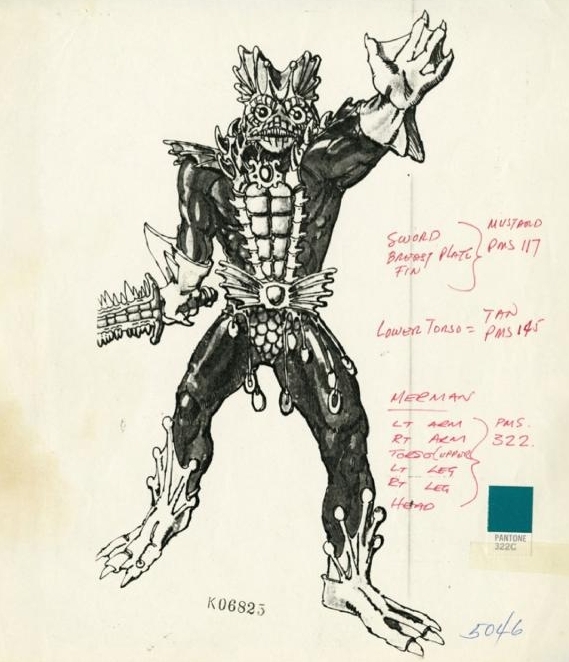 Over the course of his design process, Mer-Man was simplified to the point where he could entirely reuse the body and limbs used for Skeletor. 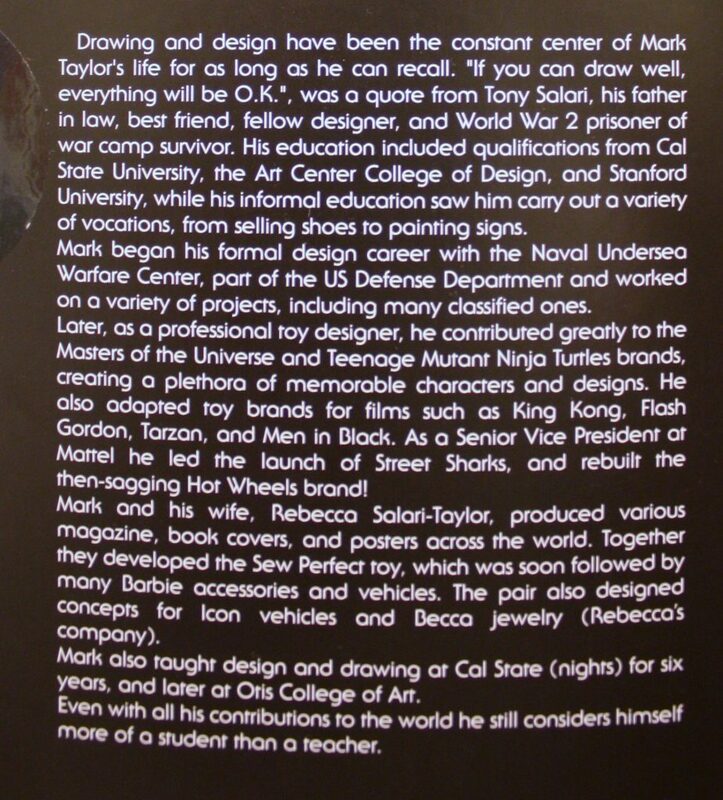 Seeing Mark Taylor’s original concept now, it’s unfortunate that his vision was never fully realized in toy form. One of the hallmarks of many of these drawings by Mark Taylor is their mix between highly detailed realism, and the altered dimensionality inherent in the production of a plastic toy. 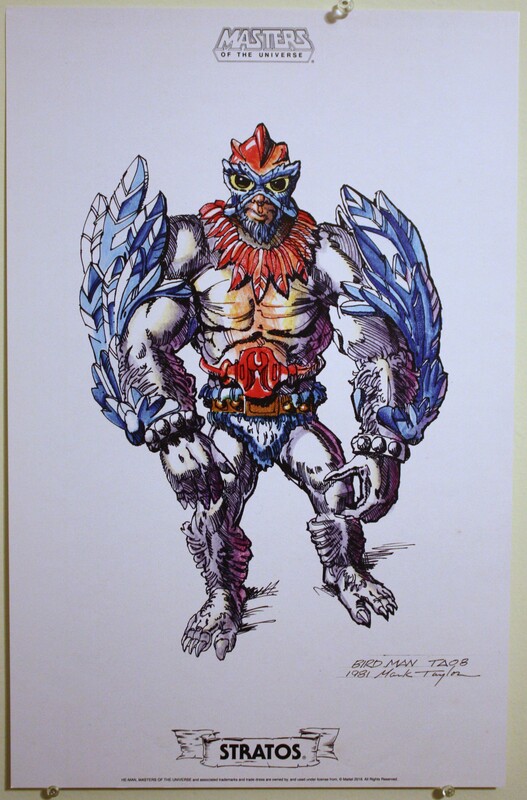 That is apparent throughout the portfolio (for instance, Mer-Man’s gloves), but also in the shape of Stratos’ (originally known as both “Bird Man” and “Wing Man”) feathers. A fully realistic illustration would have rendered the feathers much thinner in profile, but of course Mark was creating this artwork with molded plastic toys in mind as the end product. The biggest detail about this artwork that sticks out to me are the eyes. We’re used to seeing Stratos’ “eyes” as goggles, but here they do appear to be his eyes. 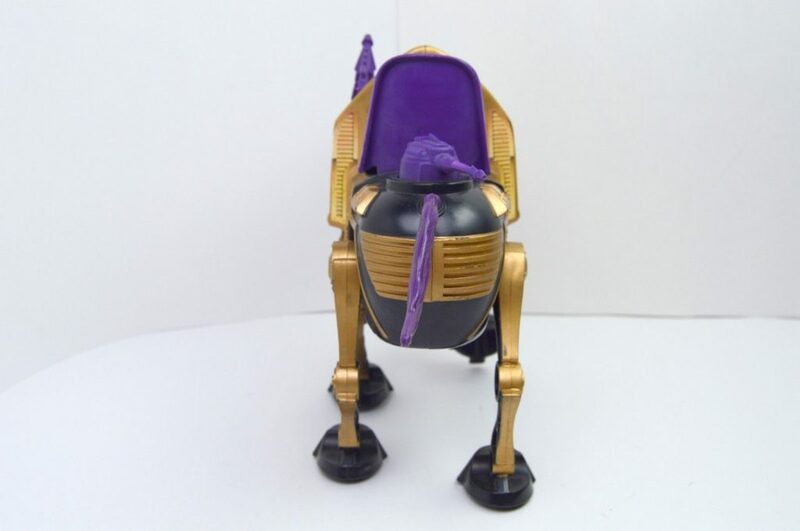 This transforms his look completely, giving him a much more bird-like appearance than was evident in the vintage toy. Another thing to point out here is Stratos’ backpack. 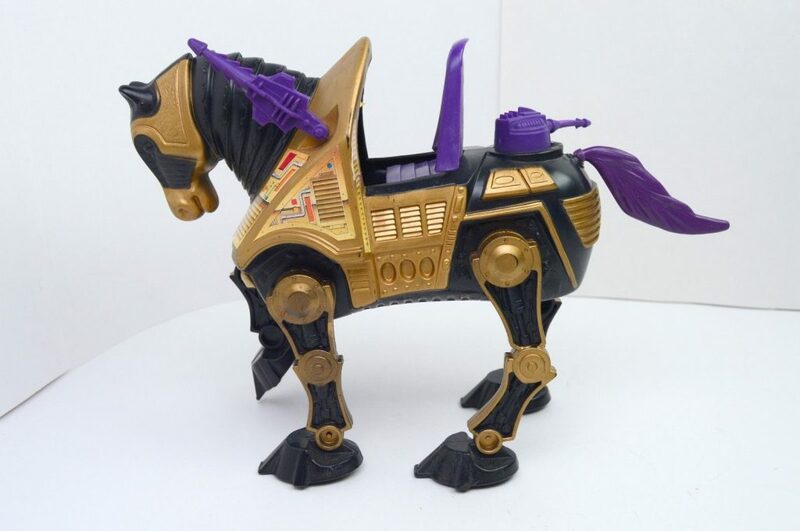 The design around the front is quite different from either the vintage toy or the cross sell artwork, as there are no straps going down his chest. 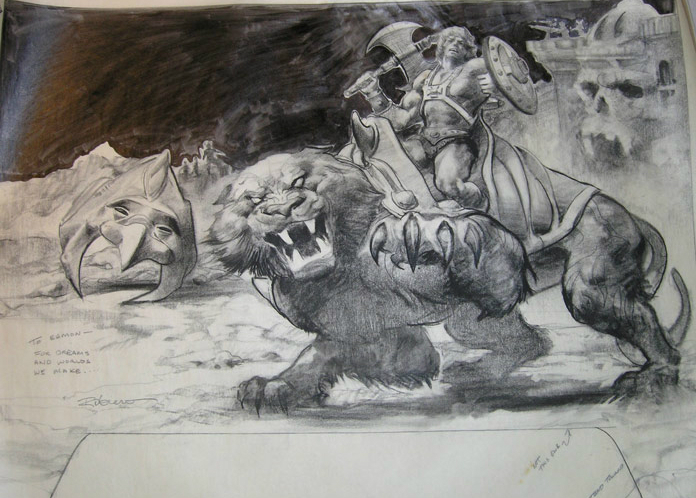 Alfredo Alcala based his early illustrations on this concept Stratos, although he got the skin (or perhaps fur) color wrong. As you can see, Mark added some yellow and tan lighting effects to the center of Stratos’ chest, but I believe the intent all along was for Stratos to be light gray. This Zodac (or “Sensor” as he was originally called) drawing was no doubt created last of the 11 pieces included in this portfolio. 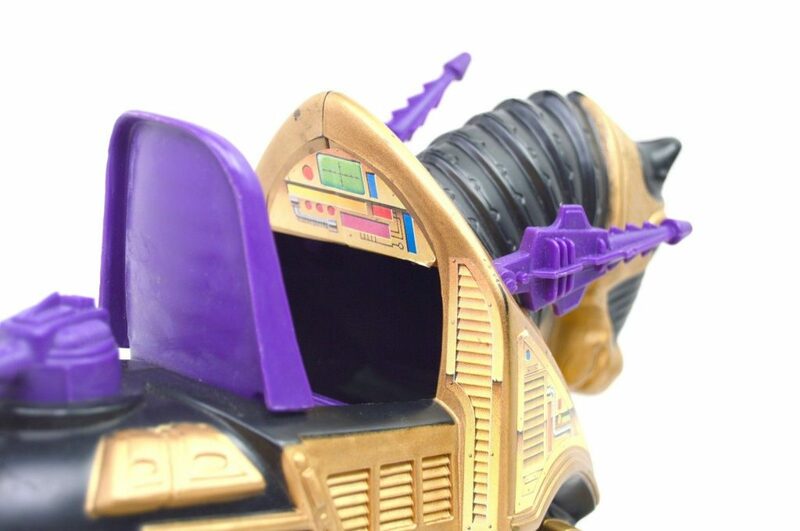 As Emiliano Santalucia pointed out several years ago at Grayskull Con, the design details are based on parts already sculpted for the toyline – specifically Skeletor’s arms and legs and Beast Man’s chest. This is the only piece in the portfolio that has not been published in any form until now. As such it was the one I was most curious about, and it did not disappoint. Zodac’s expression here is heroic, if a bit cocky. 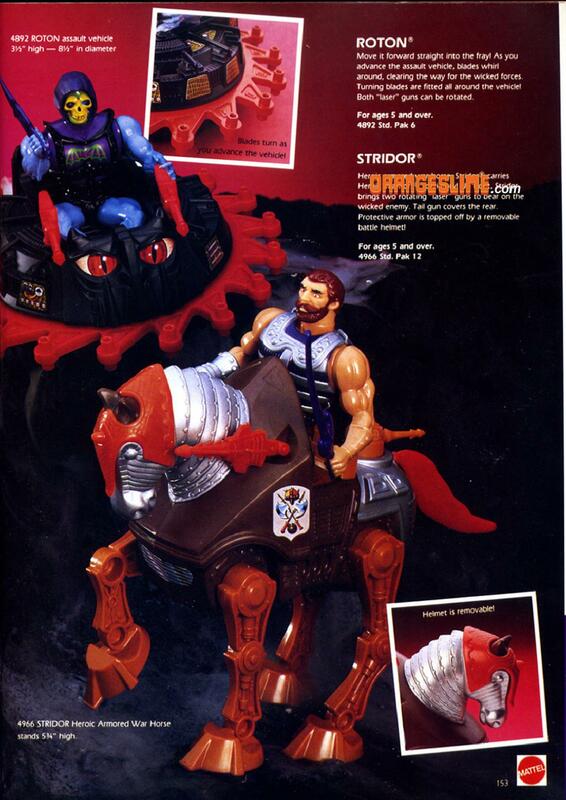 Mark’s original intention was for Zodac to be an ally of He-Man. Perhaps the name “Sensor” came about because his helmet enhanced his vision and hearing – at least that’s my guess, going from the design cues. 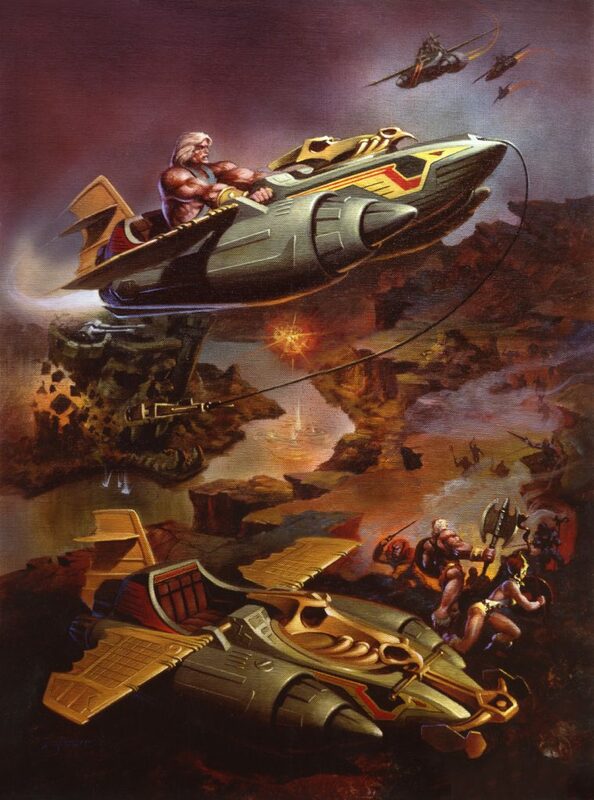 Mark has also said that Zodac “was all about flying” – perhaps he would have provided air support for He-Man in the Wind Raider. As amazing as this artwork might look on your flat screen monitor, trust me when I say that it’s nothing compared to how it looks in person. This portfolio was printed in a limited run for San Diego Comic Con, so not everyone was able to get their hands on it. I hope that Super7 and The Power and the Honor Foundation will eventually make more copies available for fans who couldn’t get it the first time around. 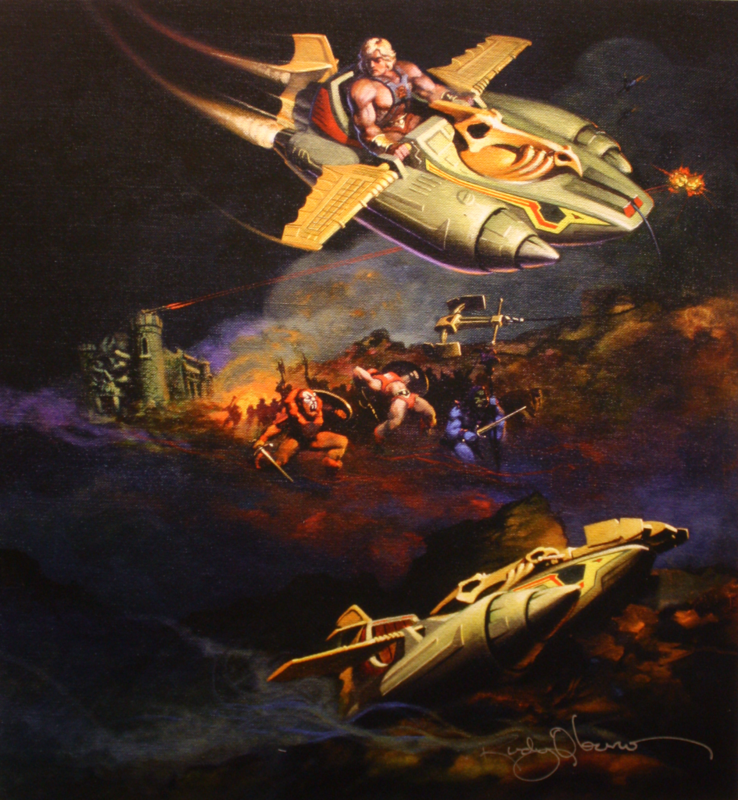 If you are even a moderate He-Man fan, you need this artwork in your life. As I intimated earlier, I’d love to see a sequel to this portfolio. 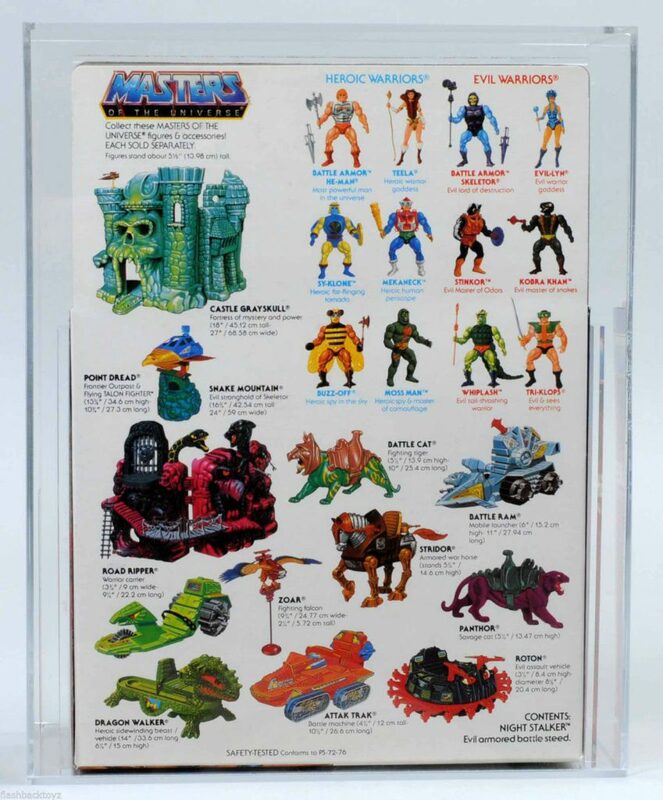 Items on my personal wish list would include the August 8, 1981 version of He-Man, alternate versions of any of the characters included in this portfolio, and artwork for Man-E-Faces, Ram Man, and any number of unproduced characters that Mark might have worked on before he left Mattel. 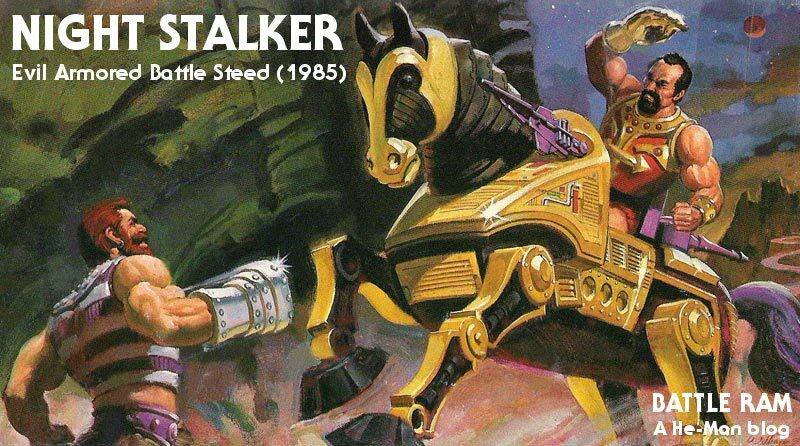 I hope also that this collection of concept illustrations will lead to the production of 3D versions of these designs, whether that takes the form of new 5.5″ scale action figures, statues, or Masters of the Universe Classics figures. 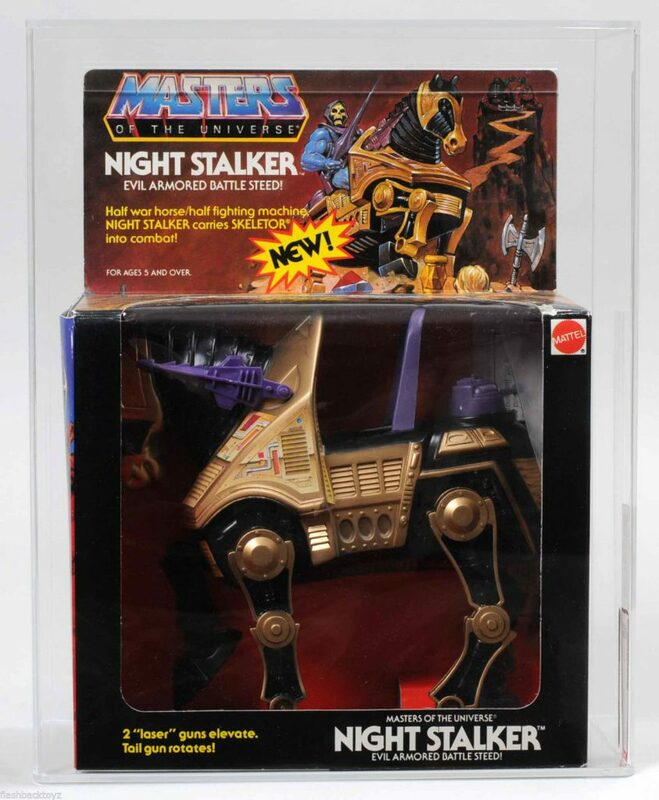 It would be, I believe, a fitting tribute to the man whose creativity and vision launched this beloved toyline. 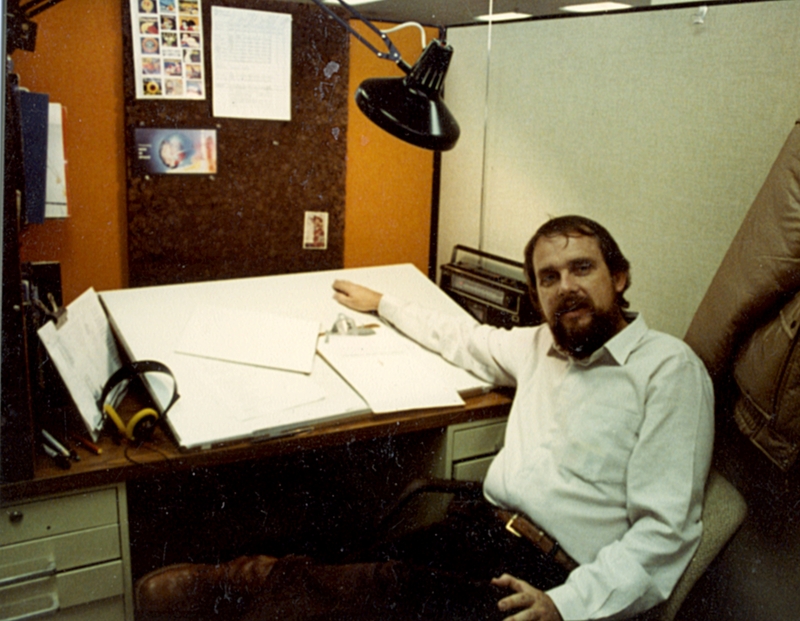 Mark Taylor in his office at Mattel. Image courtesy of Ted Mayer. Thanks to Jukka Issakainen for pushing me to write this review.